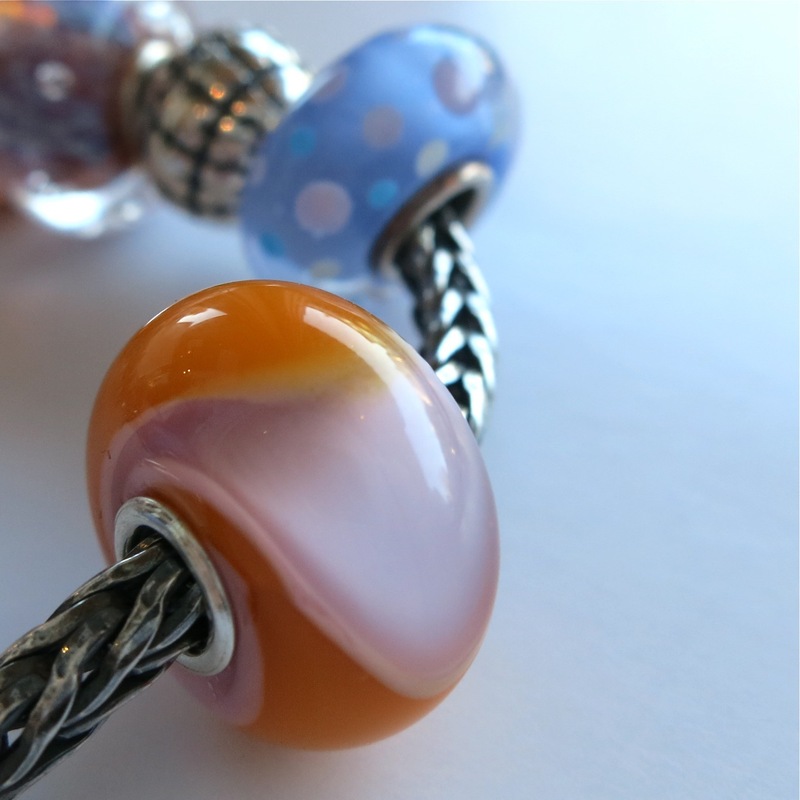 Today’s bracelet was inspired by a couple of fun uniques in a distinctive palette of lilac, buttercream and coral. They’re not unusual patterns, but today their cheerful colour combination caught my eye. Perhaps it’s because now we’re starting to look forward to Spring, and those pretty colours are just the tonic for the dark months of the year… (don’t they make you think of purple crocus?) 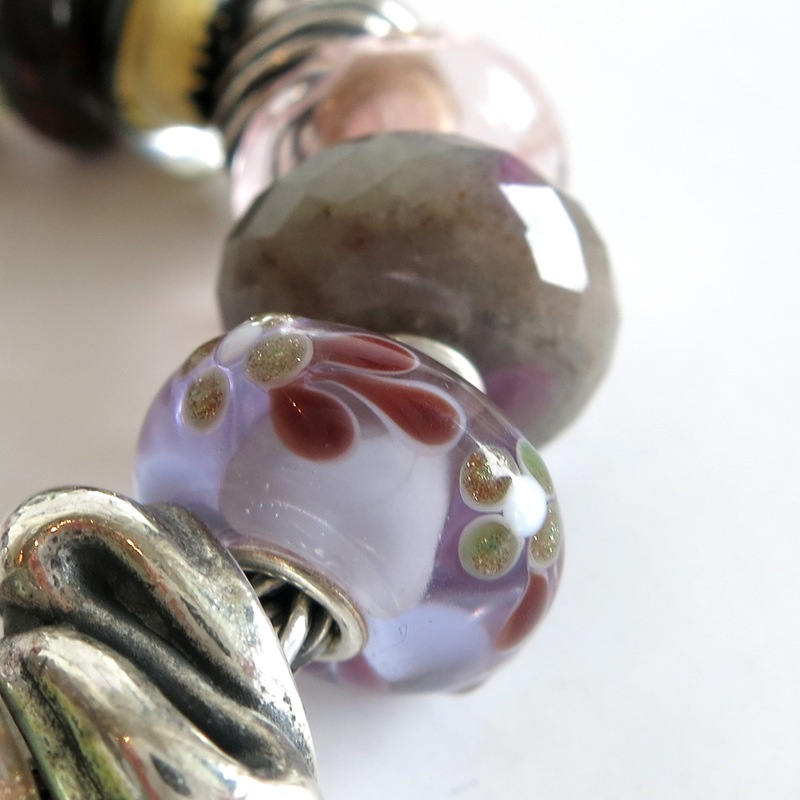 Perhaps it’s because I’m a little sad to see “Coral Bubbles” out of the collection, and these two lovelies are such perfect companions for that design… or perhaps it’s just because I was in a purple mood. Troll is so easy to toss together on a whim! 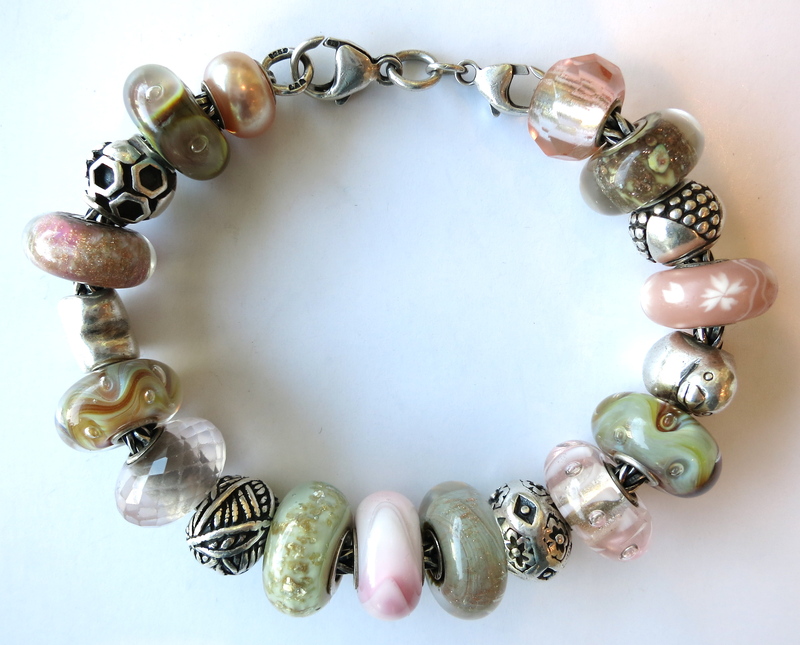 This bracelet really was so simple to tease together. 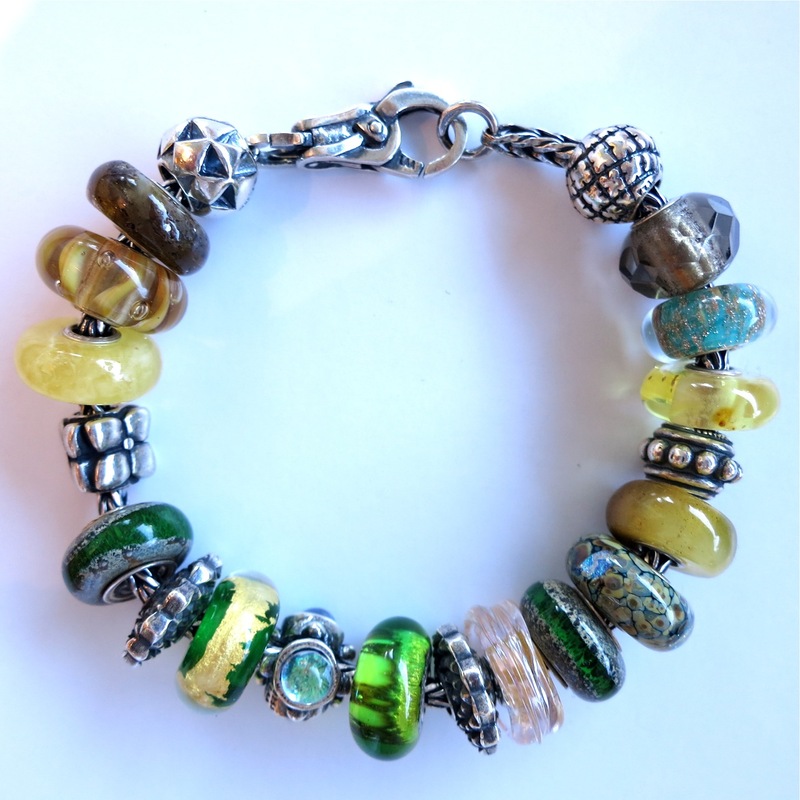 Funny, isn’t it – some bracelets are a struggle from beginning to end, and others practically design themselves. 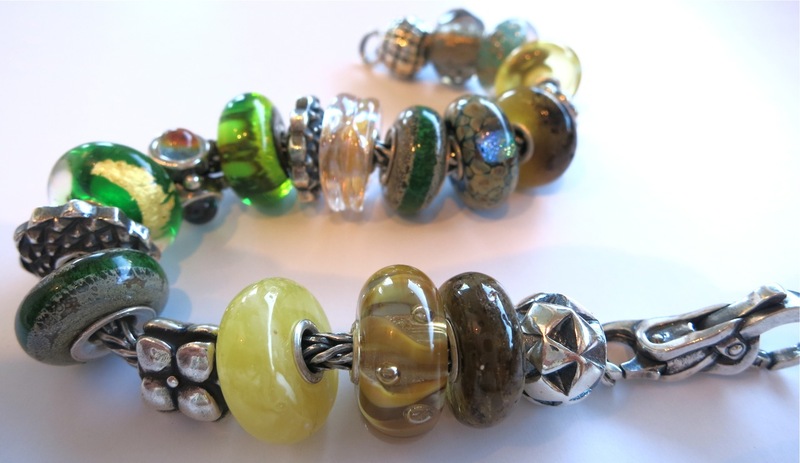 This one was very cooperative, with beads just jumping out at me from the racks, begging to be added. 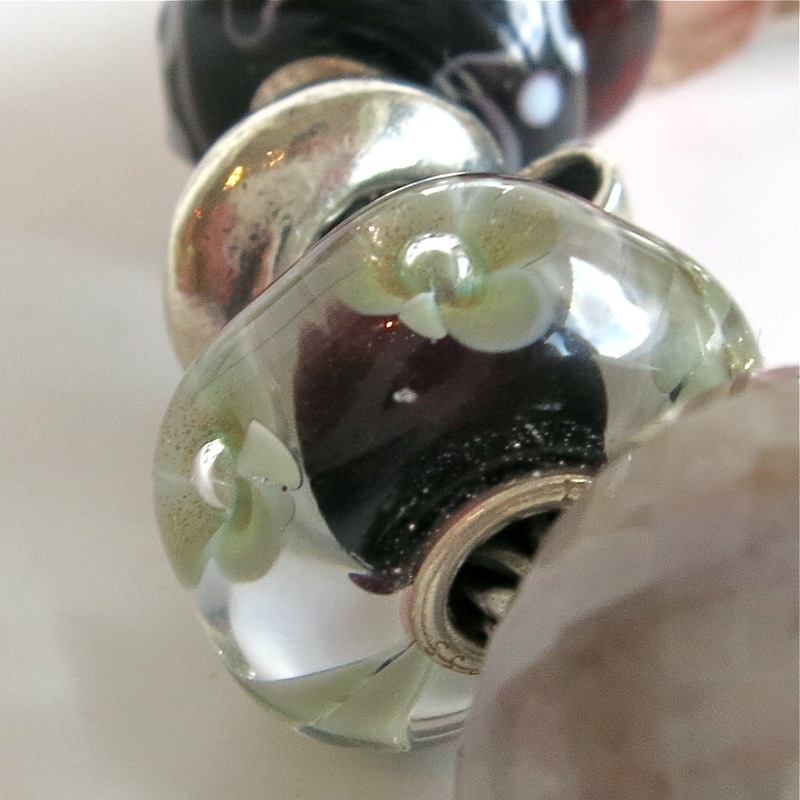 I was particularly delighted with the addition of the unique flower shown above, as it included both the oxblood and the lilac found in the “Small & Beautiful” unique at left. 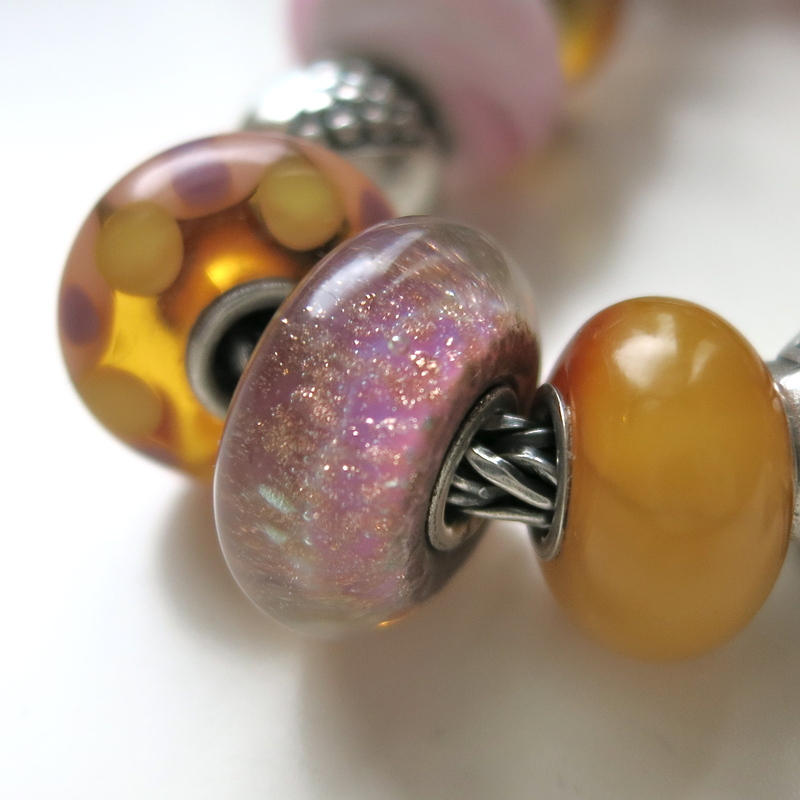 The clear glass overlay in the above unique is lilac, making it a good companion for “Golden Cave” as well. How serendipitous that the Aurora Flowers that we have in stock at the moment have such a strong garnet colour in the base! 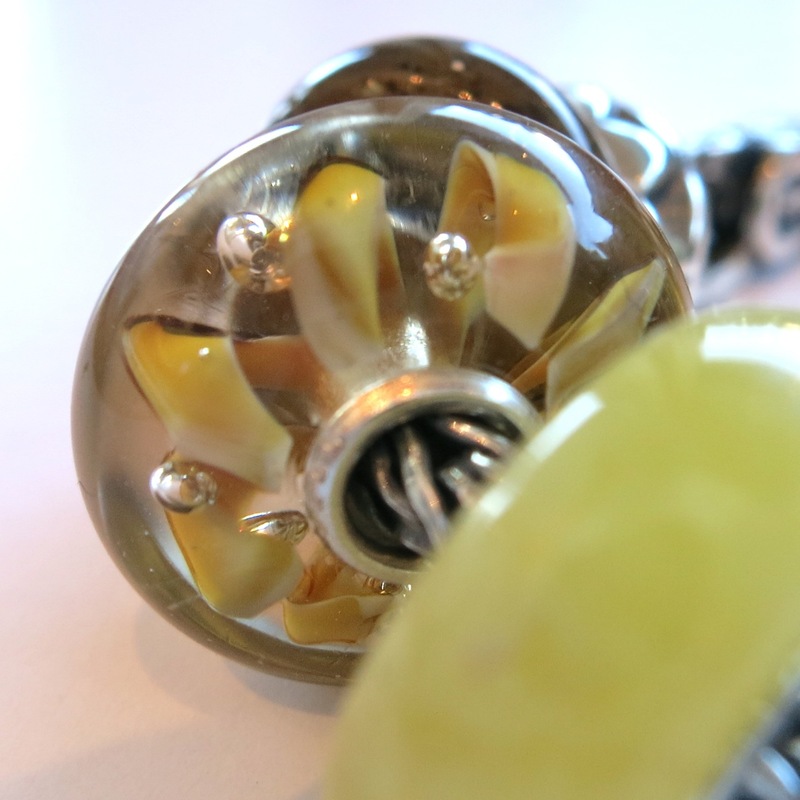 I just love how these look in the light, particularly with the very light, lemon-y “Golden Quartz”…. Just perfect for this spiced lilac combination. 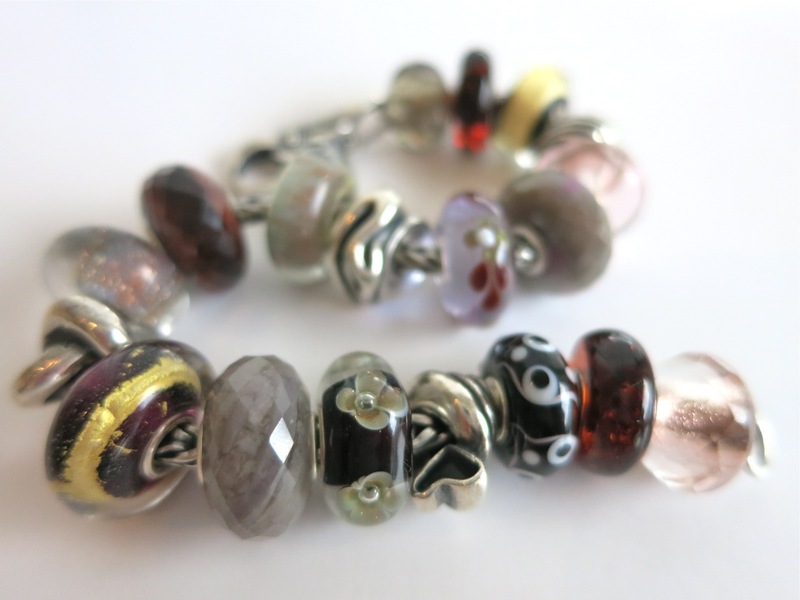 The thing I like best about this palette is how simple it is to create with a wide variety of bead designs…. 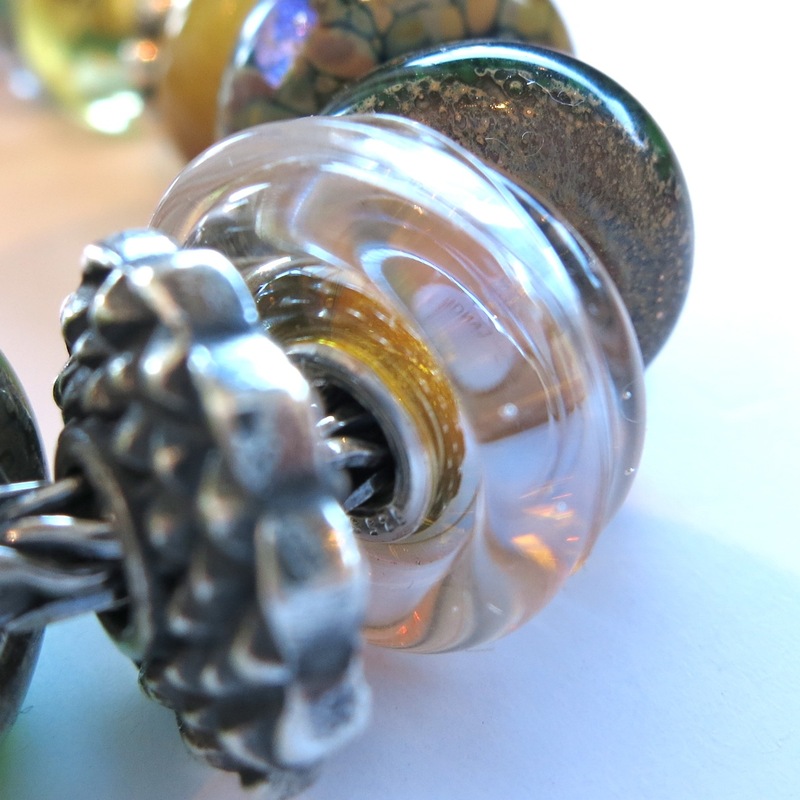 Most of us have collected some golden hued beads and some aurora glass. 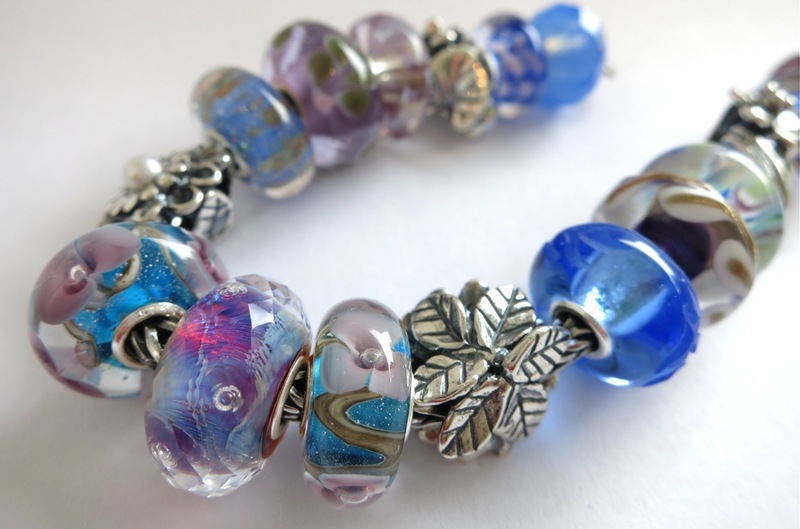 Perhaps your purples were in play with other jewel tones through the Autumn and Winter, but they can be rearranged into this palette for early Spring in a snap. 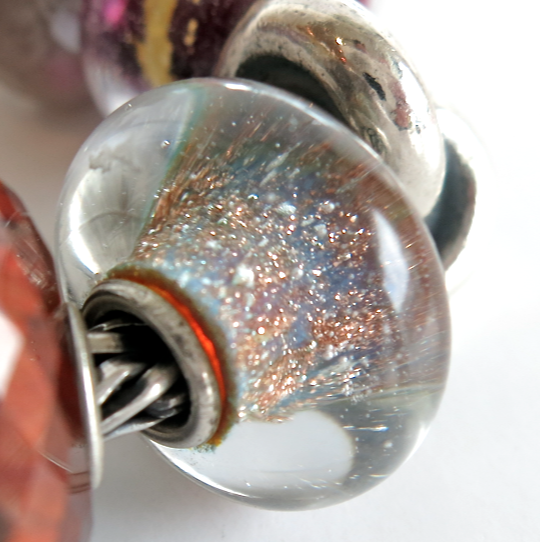 Clockwise from Clasp: “Stories of You” limited edition clasp, “Unique Glass”, “Etruscan” (retired), “Coral Bubbles” (retired), “Unique Glass”, “Unique Glass”, “Cherry Blossom”, “Goldstone” (retired), “Spiritual Ornament”, “Aurora Flower”, “Golden Quartz”, “Aurora Flower”, “Swarm of Butterflies”, “Limited Edition Carnelian”, “Zanzibar” (retired), “Unique Amber”, “Unique Glass”, “Unique Glass”, “Starry Night”, “Unique Glass”. 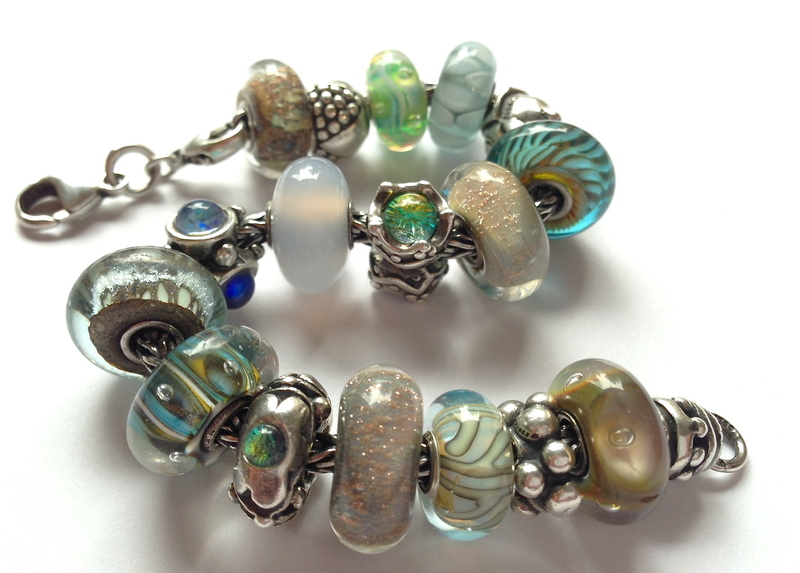 Today’s bracelet was one that I designed at the end of a very busy and challenging week… it was in the quiet hour at the close of the day, and I was reveling in the calm of our little gallery in the middle of the bustling village. Outside, people were rushing past in the rain, carrying groceries and hurrying to get home to cooking and family time. I, however, had a few minutes to just play and then capture my calm time through the lens of my camera. Deserts”, as they are both lovely examples of the design, and are fascinating to me in their extreme diversity. 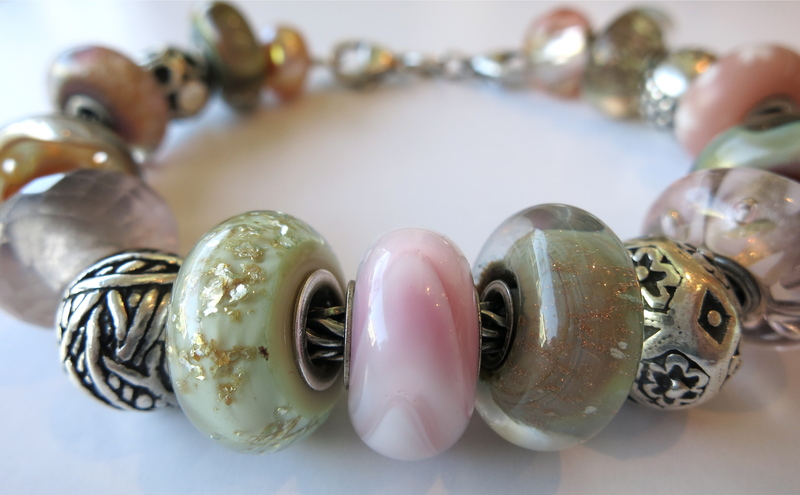 One of the two deserts is nearly celadon green in colour, with a pinkish blush that is very interesting. 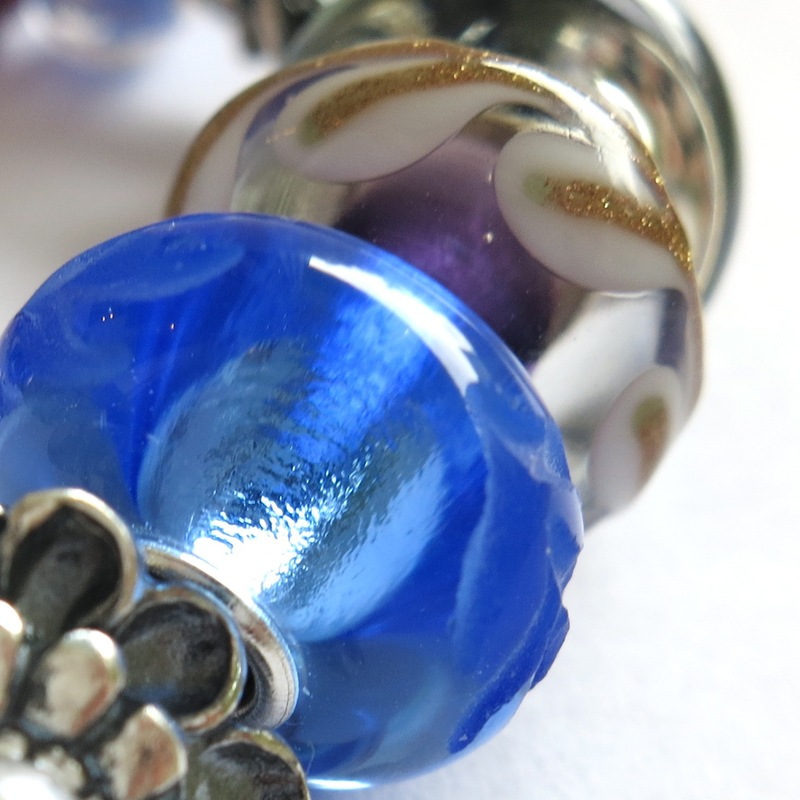 The other is a perfect slate blue with a generous dose of golden glitter and a rich coating of clear glass on top. 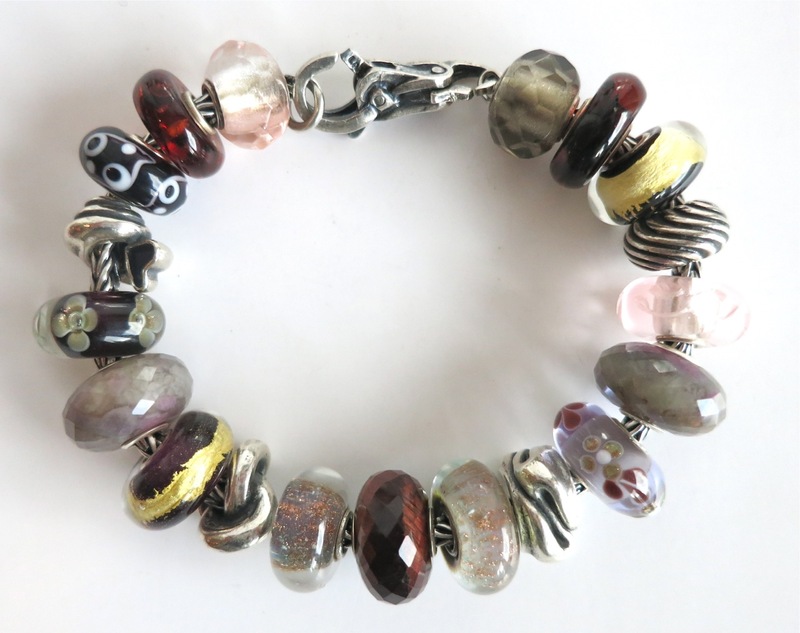 While it is the rich clarets and golds that immediately capture one’s attention in this bracelet, the “meat” of the design is really the grey neutrals. Without those soft, quiet colours this would be a very different design. 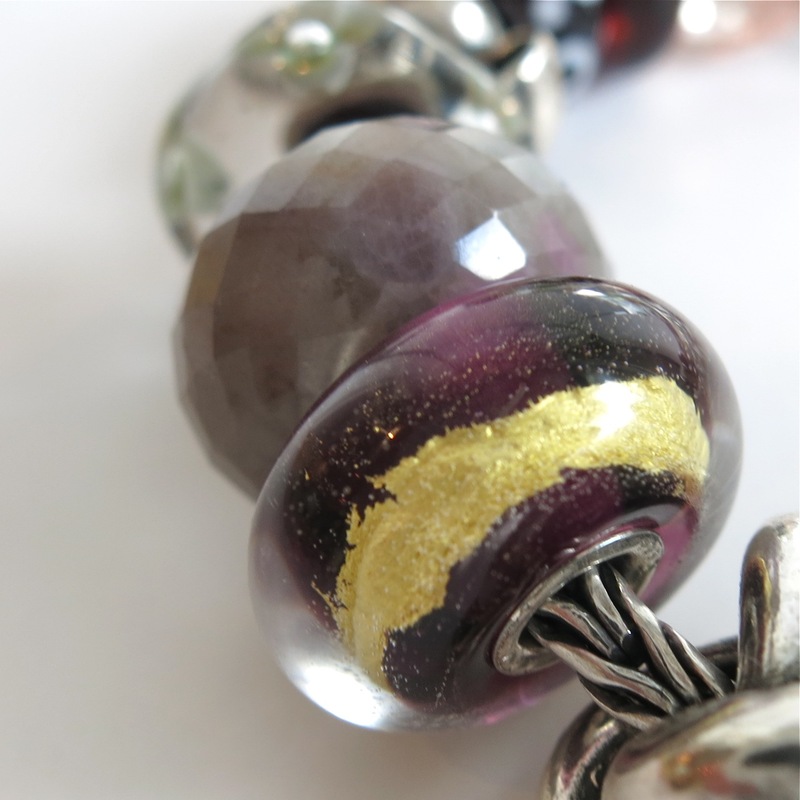 The rich jewel tones would sing much louder, and be much more formal in their mood. 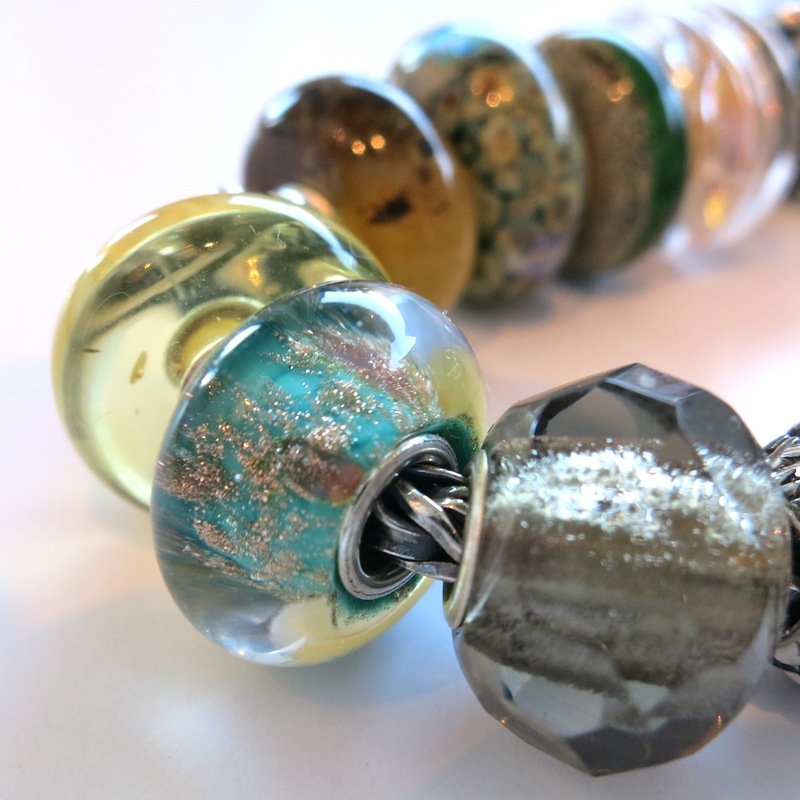 The addition of the two “Ruby Rock”, “Blue Deserts” and “Grey Prism” creates a neutral envelope which could be used with so many different jewel tones for a wearable, everyday design. 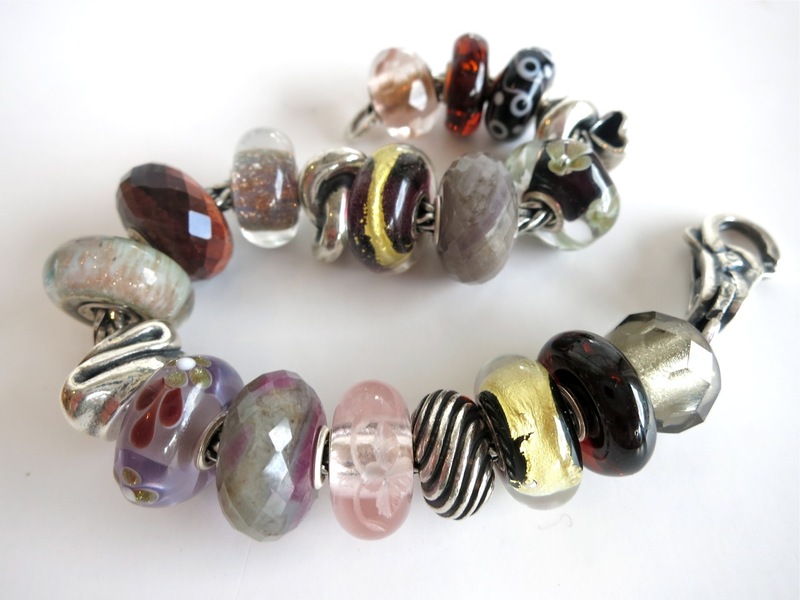 Clockwise from clasp: “Freya Lock”, “Grey Prism”, “Unique Amber”, “Black Gold”, “Gentle Waves”, “Engraved Romance”, “Ruby Rock”, “Unique”, “Transformation”, “Blue Desert”, “Red Tigers Eye”, “Blue Desert”, “Trefoil Knot”, “Third Eye Chakra”, “Ruby Rock”, “Unique”, “Heart Conch”, “Unique”, “Unique Amber”, “Pink Prism”. 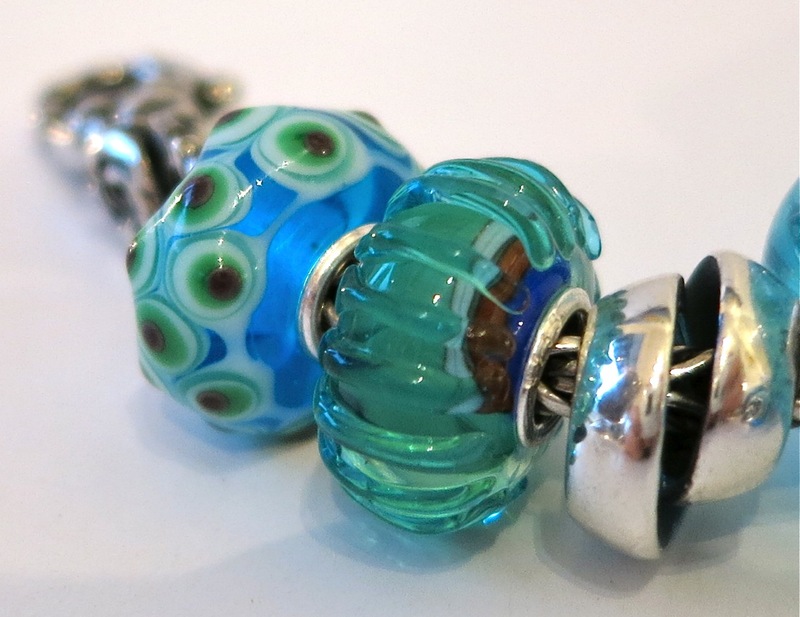 This bracelet was inspired by both the new blues of Spring 2015’s Trollbeads Collection… and also by the arrival of a pair of extraordinary uniques. 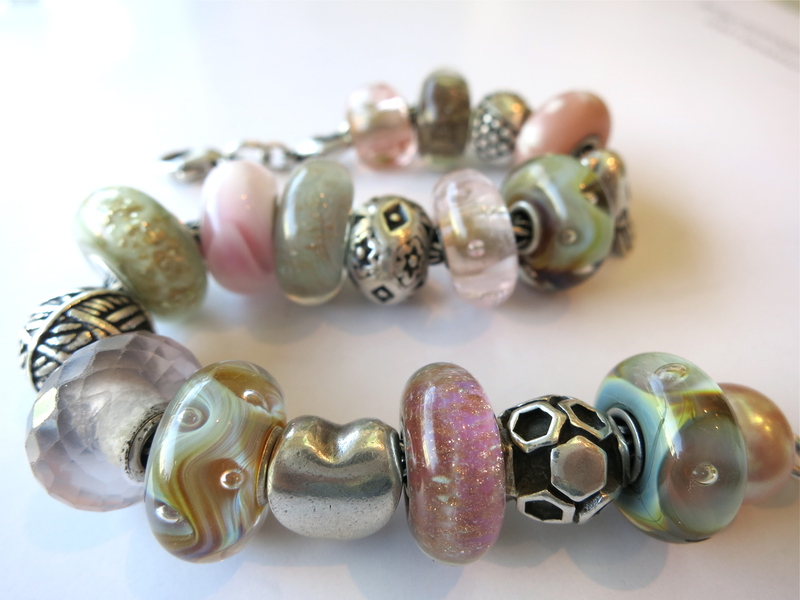 When designing a new bracelet, I love to blend two or three colours together to form a palette that delights the eye. 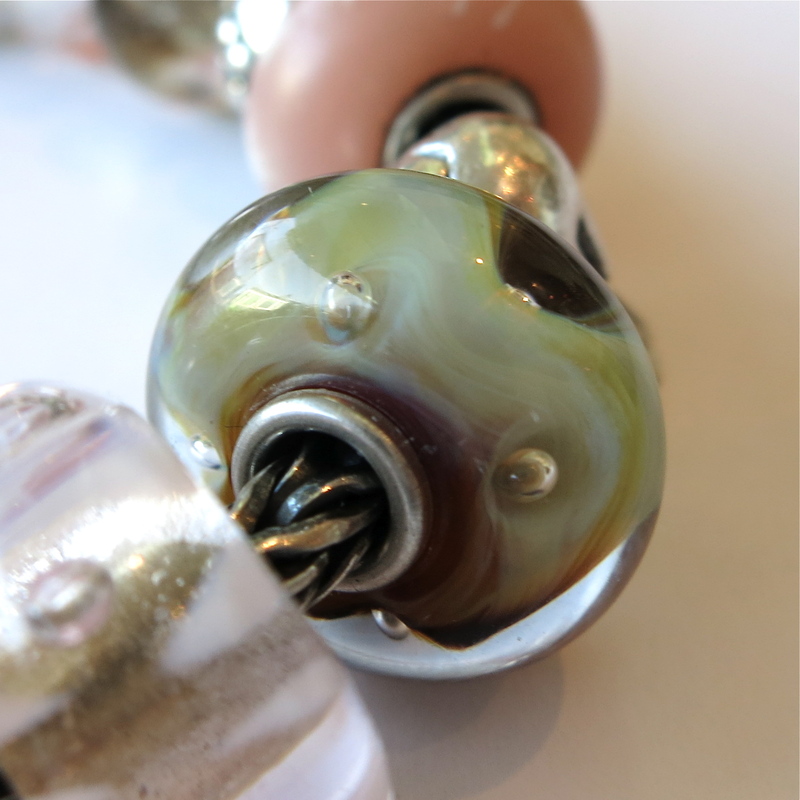 there is no better way to “gel” the entire feel of a composition than to find a few beads that include all the colours of the design. 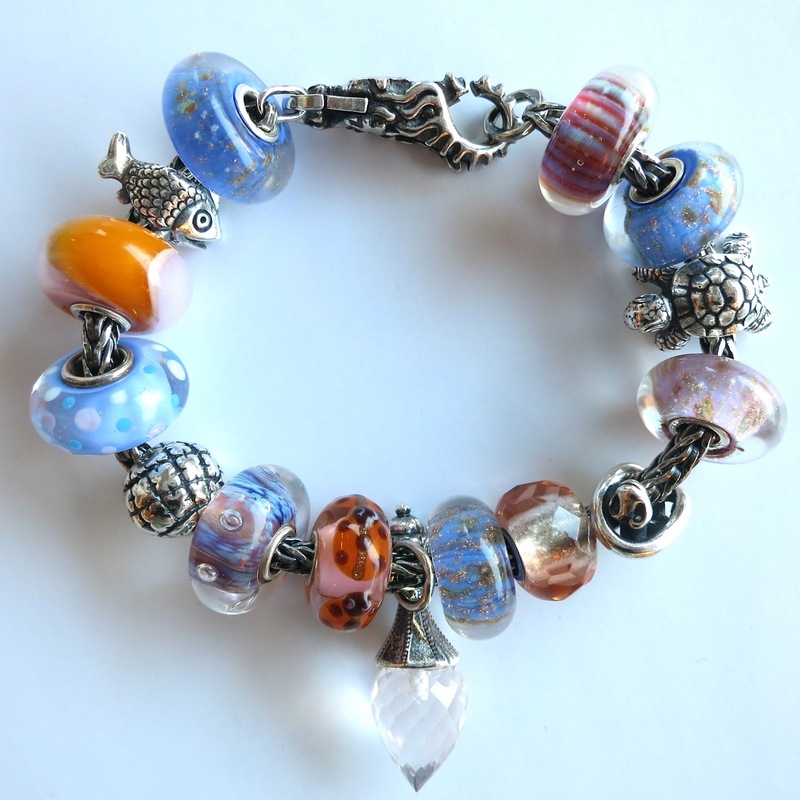 Often, I find a gorgeous individual bead, and let the entire bracelet follow it’s lead! 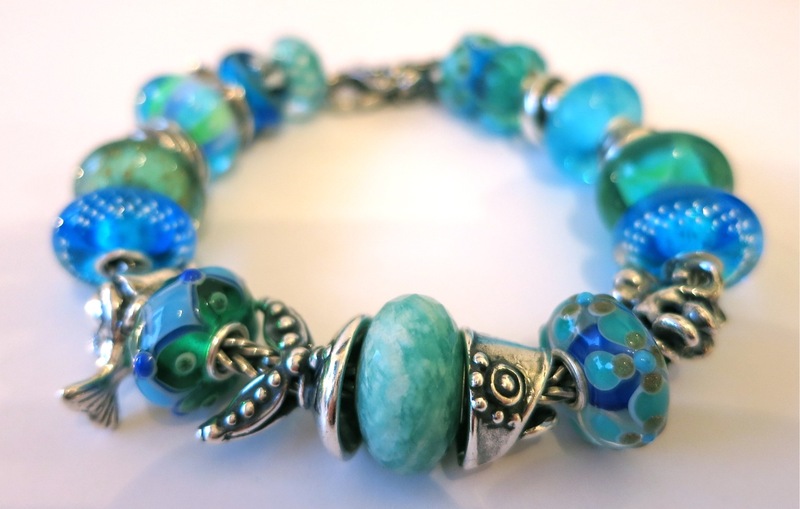 ocean themed blues therein, I decided to play together a cerulean blue and aqua blend. 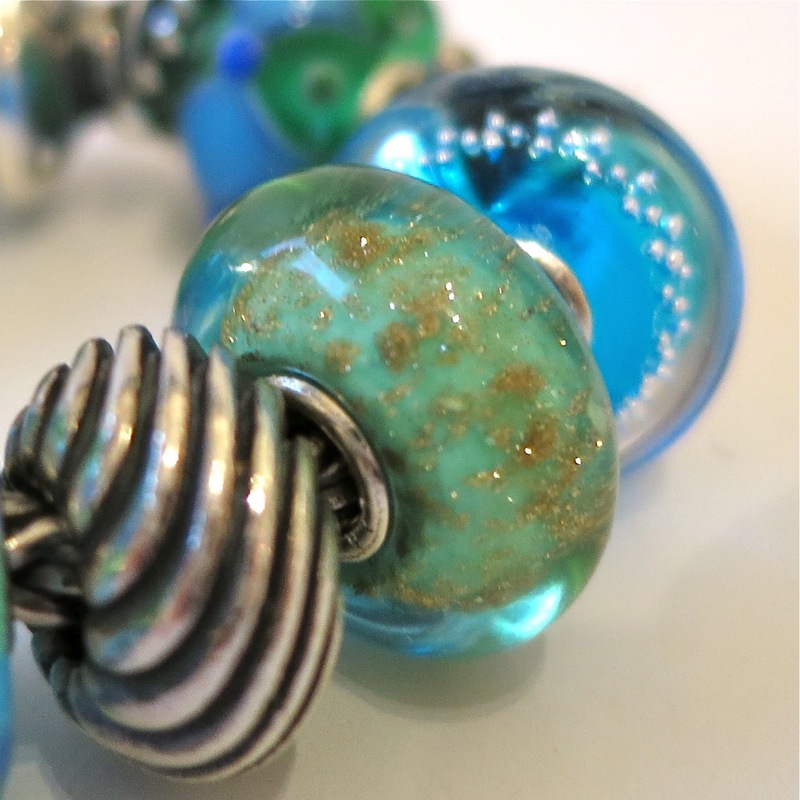 The luscious new blue glass, “Silver Trace, Turquoise” (shown above) is so luscious – doesn’t it seem such a natural addition to the collection that it already feels as though it must have been there all along?! 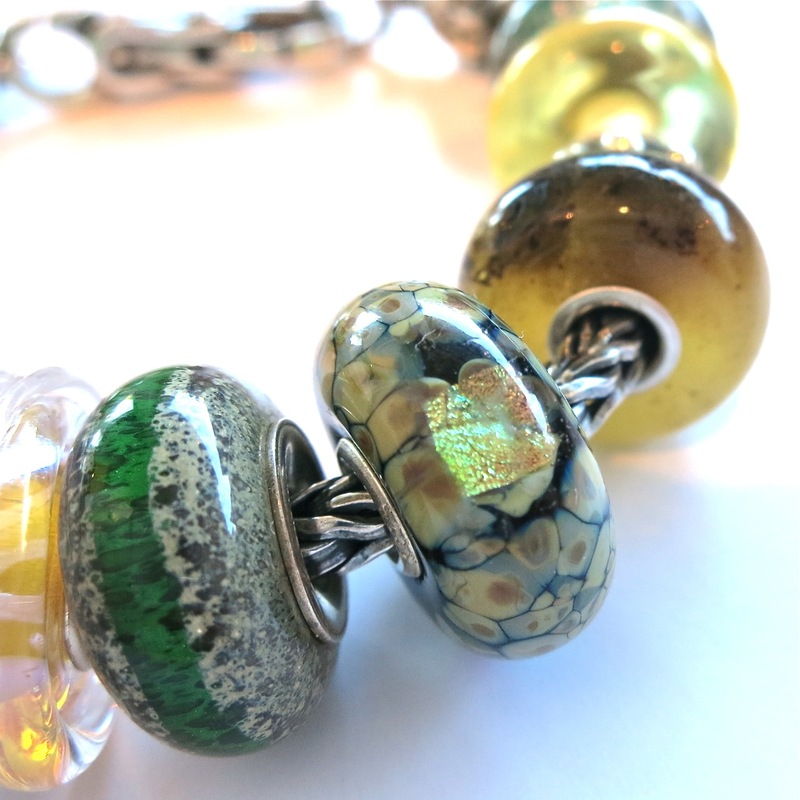 “Seabed” is a welcome addition as well, for those ladies who love golden murano sparkle, and long for those slightly softer tones…. 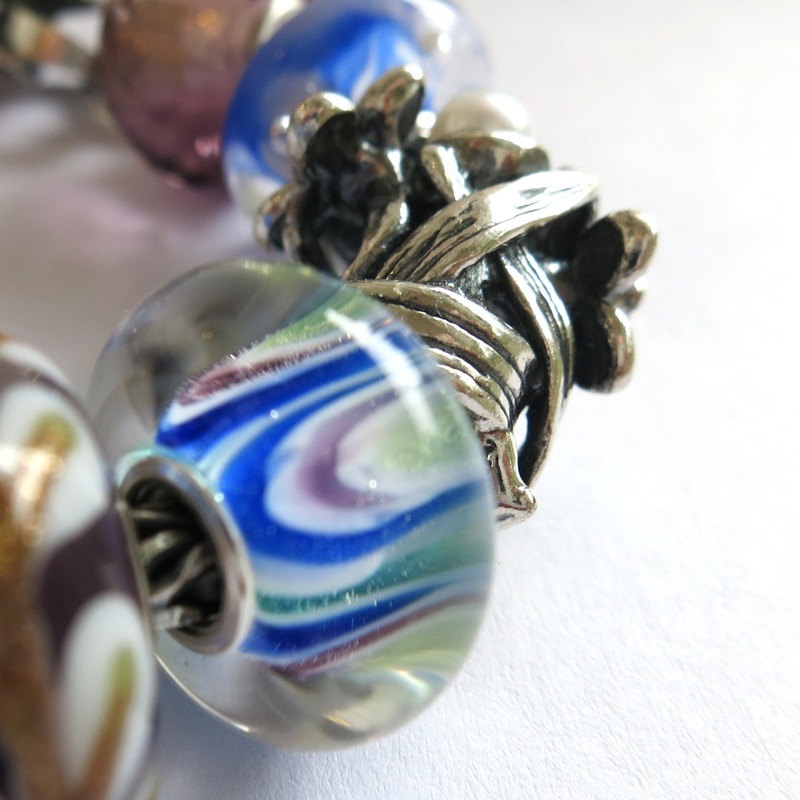 “Gentle Wave” is a silver in the classic Trollbeads approach. 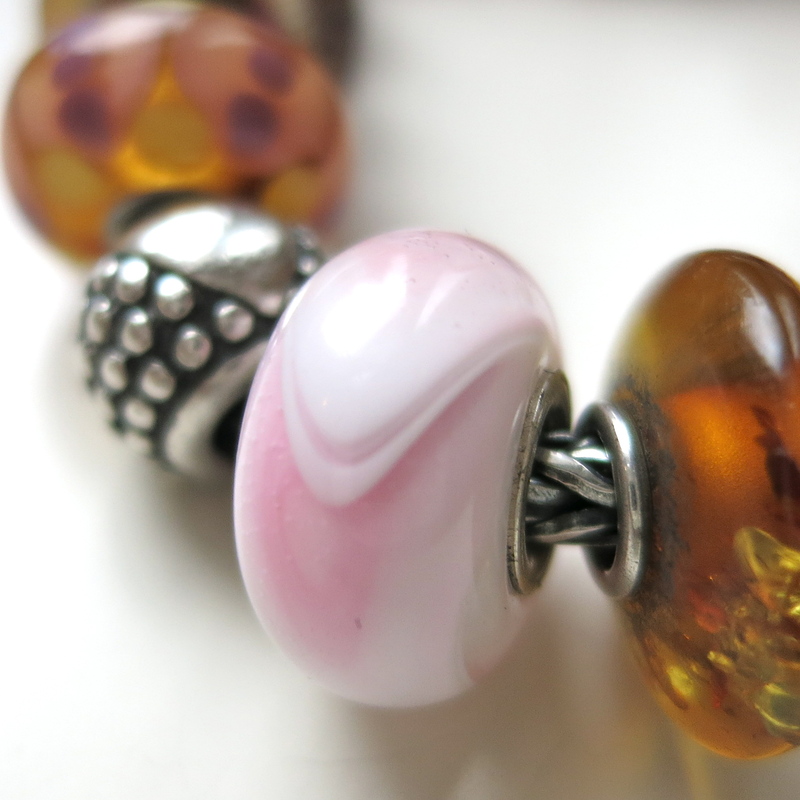 It feels satisfyingly heavy, and is a lovely oval shape that will balance well with “Zanzibar” or the “Cherry Blossom Bead”. 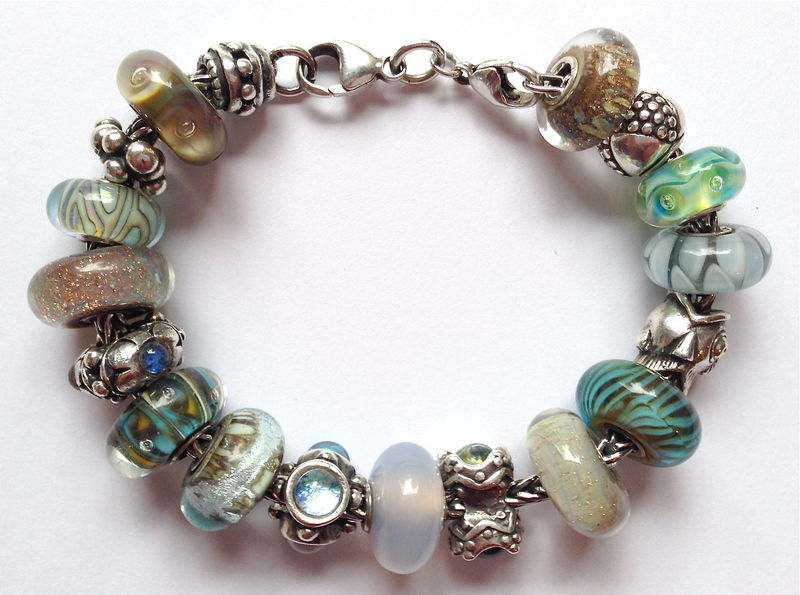 Clockwise from clasp: “Water Lock”, “Unique Glass”, “Unique Glass”, “Neverending, Sterling”, “Sea Glow”, “Heart Conch”, “Spring Wave”, “Silver Trace, Turquoise”, “Guardian of Treasures”, “Unique Glass”, “Jewel of Sea – part A”, “Amazonite”, “Jewel of Sea – Part B”, “Unique Glass”, “Mermaid Companion”, “Silver Trace, Turquoise”, “Seabed”, “Gentle Wave”, “Seabed Stripe”, “New Horizons”, “Unique Glass”, “Unique Glass”. 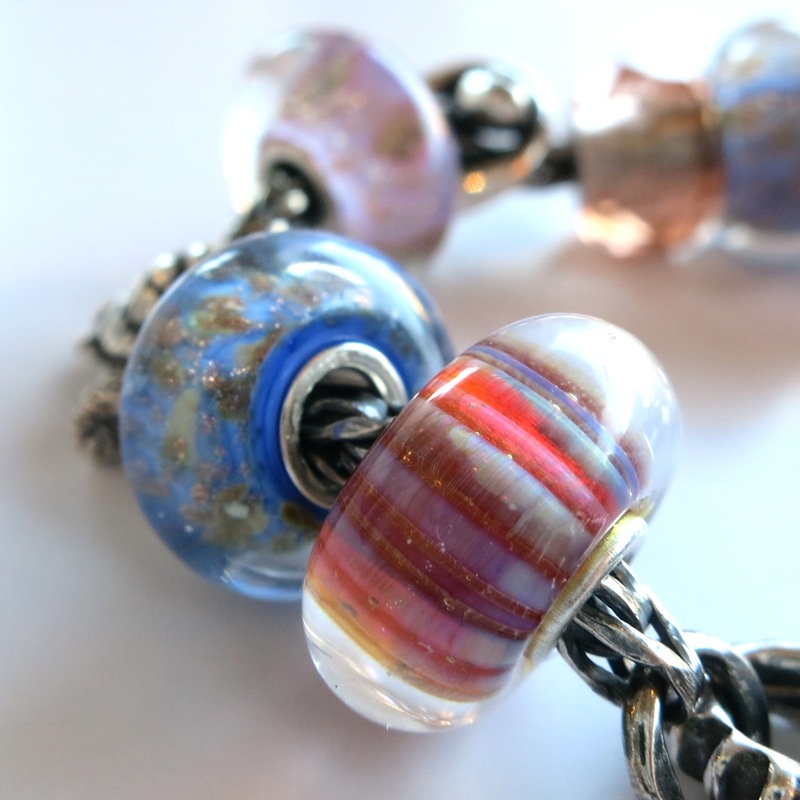 colours played together, and made up an entire bracelet of stock beads to celebrate it. 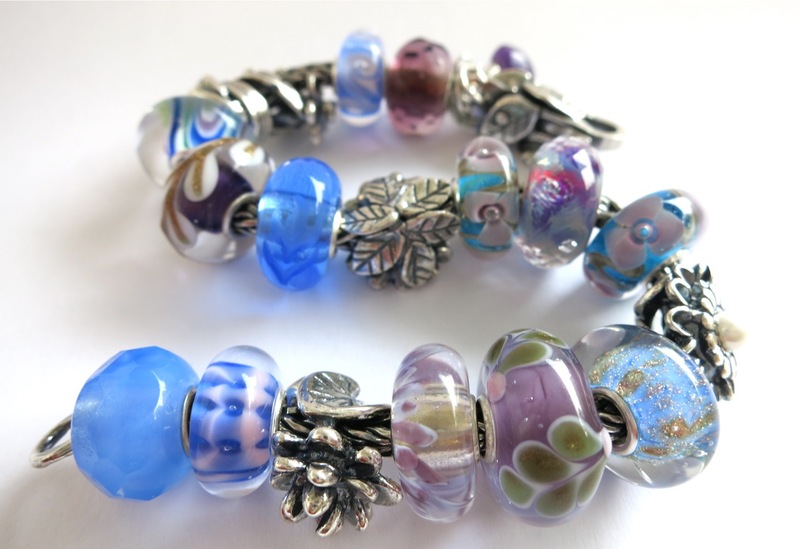 It was so pretty that I just had to go to my own bead tray to see if I could create a bracelet for myself in a similar palette. I don’t know why I had never done this before… it’s one of those bracelets that practically “built itself”, coming together in a matter of minutes. 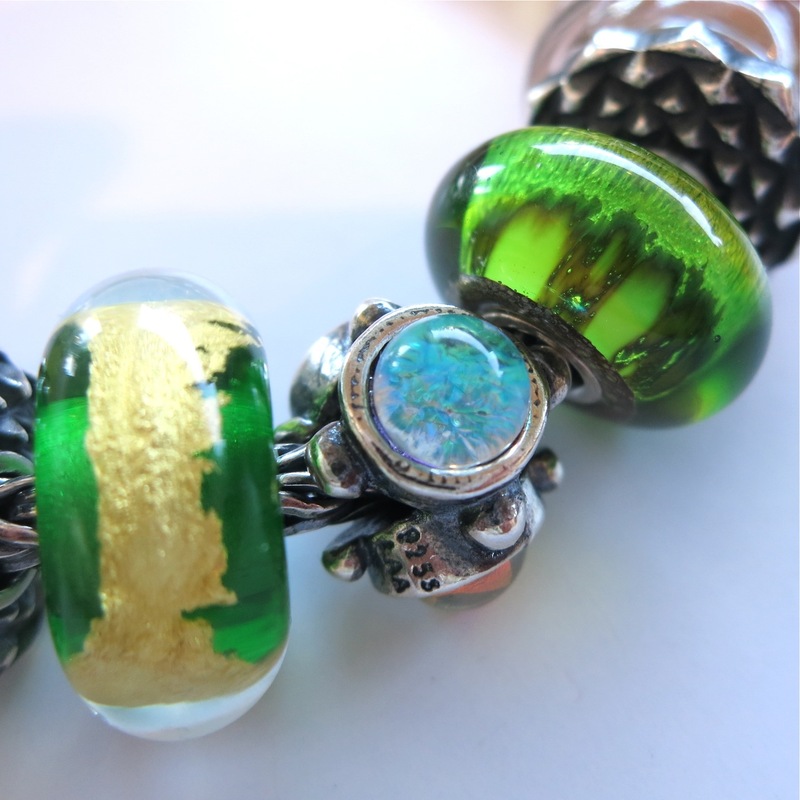 Note that two of these center beads were custom made beads, by Georgina of Trollbeads Canada… the celadon green and gold bead is her most recent creation, and I am so excited to include it in my collection. 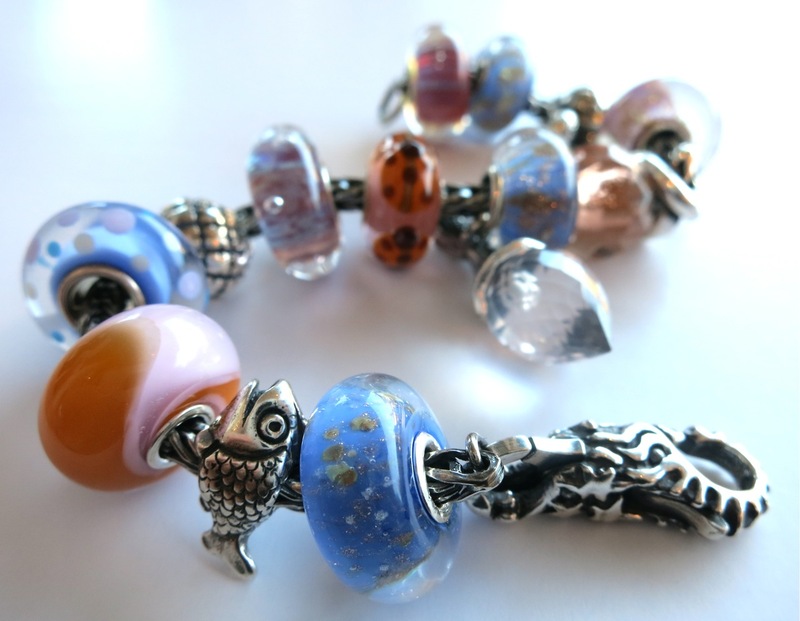 Those of you who are awaiting your own beads by mail, we just received them and will be posting today and tomorrow! 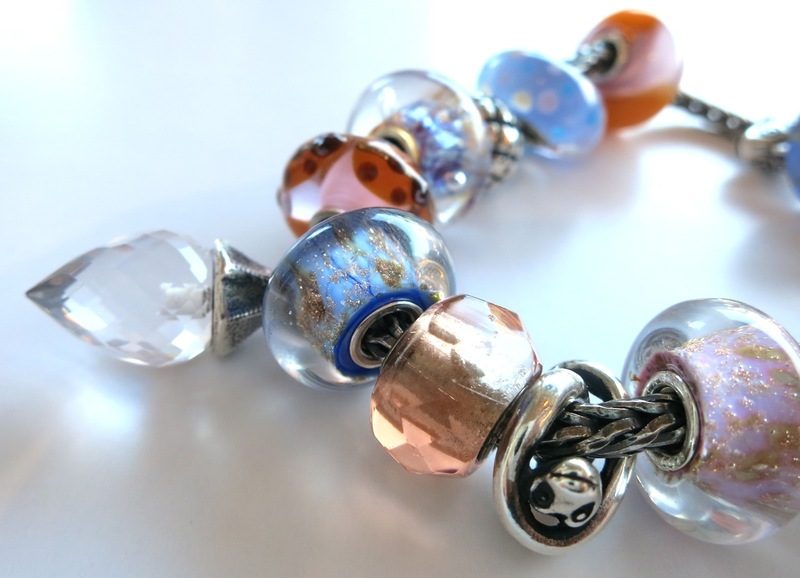 Clockwise from clasp: “Basic Double Lobster clasp”, “Pink Prism”, “Magical Lamp”, “Etruscan” (retired), “Limited Edition Kimono Series”, “Sparrow” (retired), “Azure Bubbles”, “Unique”, “Zanzibar” (retired), “Blue Desert”, “Unique”, “Unique”, “Ball of Yarn”, “Rose Quartz”, “Azure Bubbles”, “Heart”, “Pink Desert”, “Bee on Hive” (retired), “Deep Bubbles” (retired), “Rosa Pearl”. 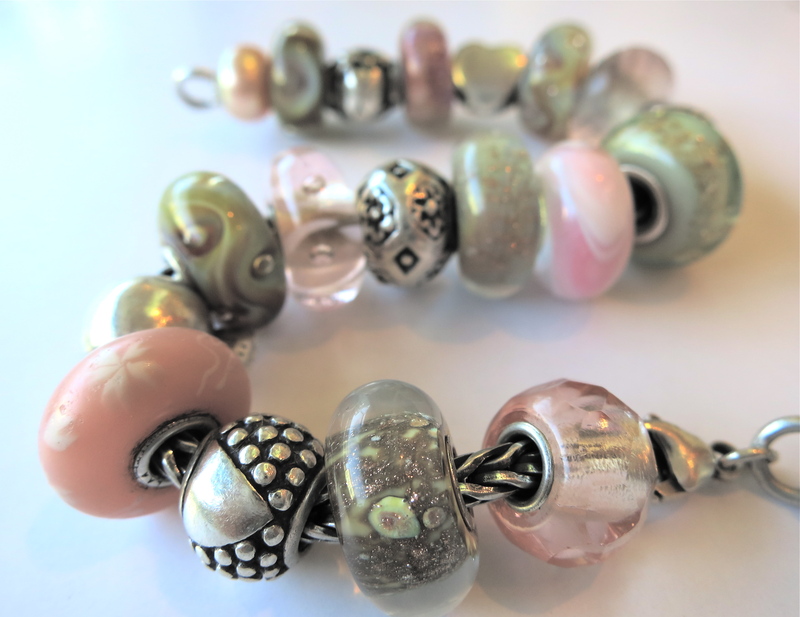 Such a gentle and soothing palette, and such a lovely way to wear pink without it feeling too “girly”! Pink delights me, but I avoid it if it feels to flighty and silly. Somehow the natural complement of green settles the pink and makes it so wearable for me. Today I felt like a feminine, pretty composition, and happily played together a rose and gold design. 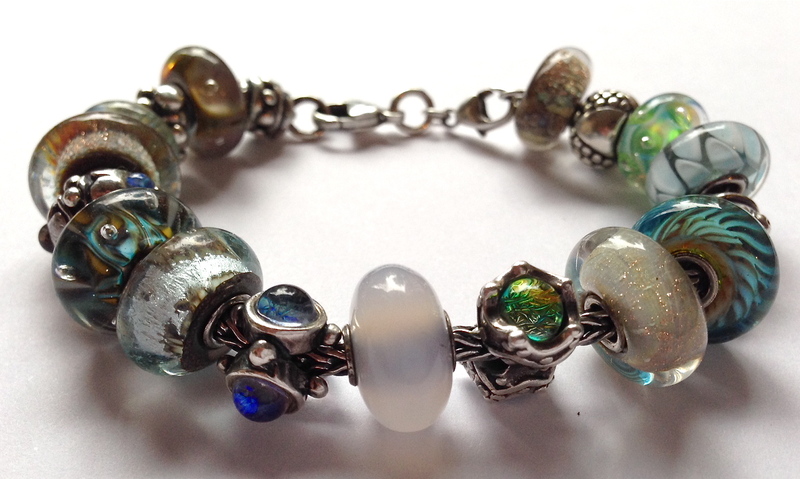 A large part of this bracelet’s inspiration comes from the “Golden Quartz” above… It was one of those beads that I had admired for ages but never quite got round to acquiring. I had promised to add a few more golden yellows to my collection after the last challenge, so I finally chose one for myself a couple of months ago. 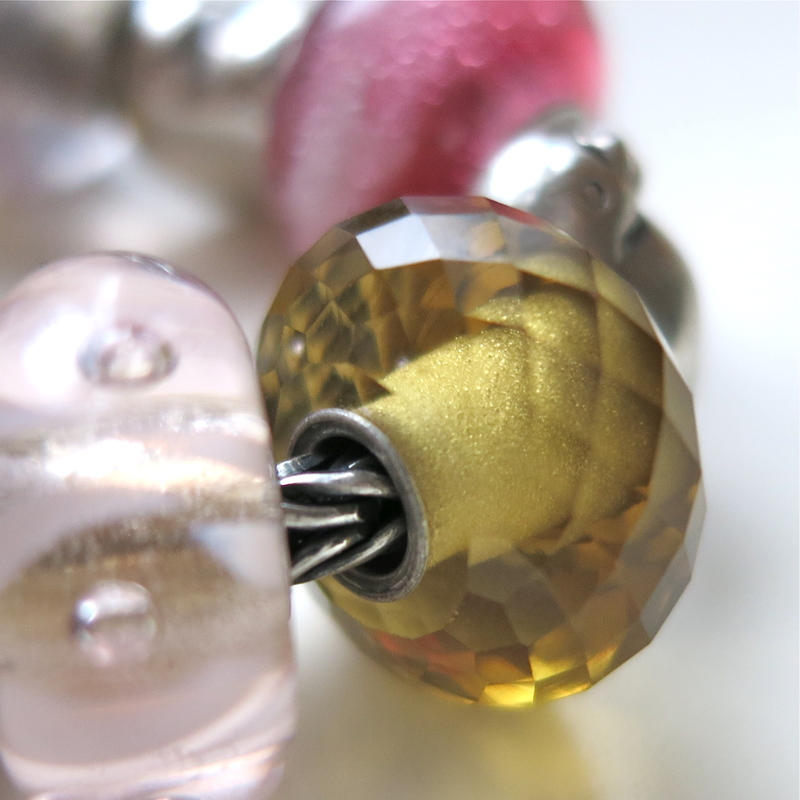 of the apricot and butter yellow unique, “Pink Desert” and a limited edition, Russian Pink, mini amber at the end… I like it opposite the “Rosa Pearl” as they are both so warm and golden, and well matched in shape as well. 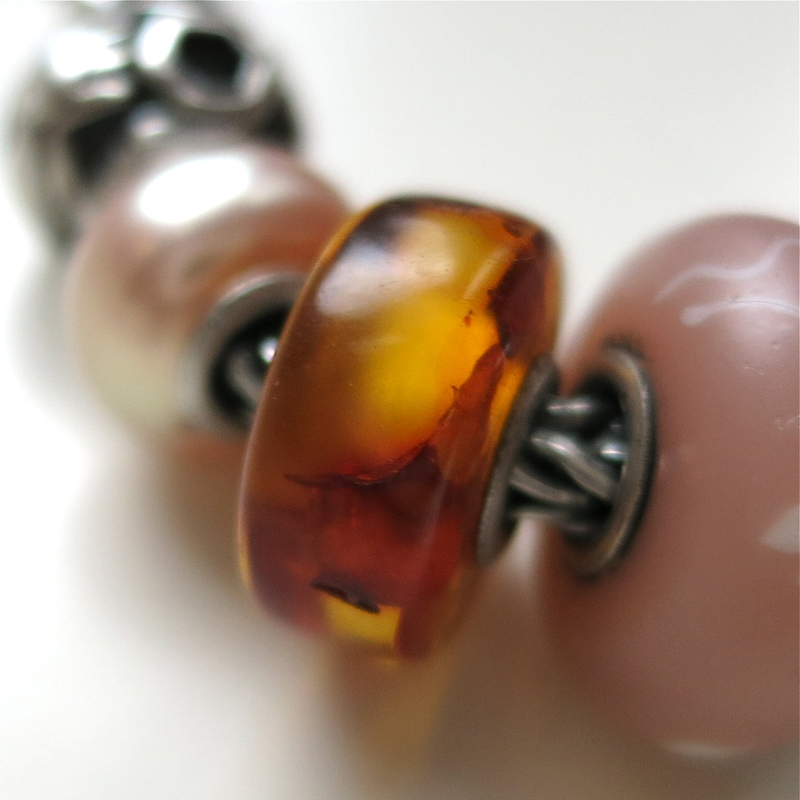 The matte, Japanese glass of the apricot toned “Kimono Bead” nicely echoes the warm Rosa Pearl. 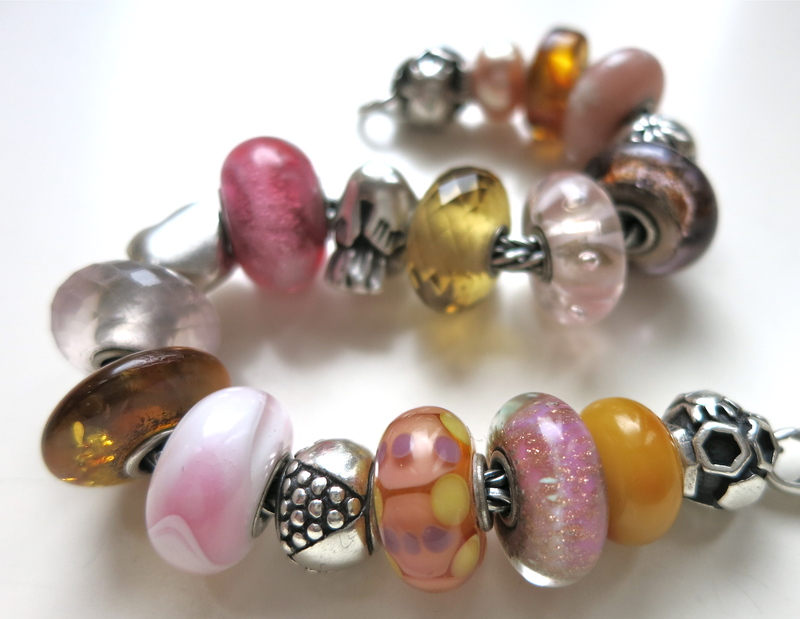 “Basic Double Lobster Clasp”, “Bee on Hive” (retired), “Unique Amber”, “Pink Desert”, “Unique”, “Etruscan” (retired), “Custom Made Unique”, “Unique Amber”, “Rosa Quartz”, “Heart”, “Golden Quartz”, “Unique”, “Golden Cave”, “Pentanque” (retired), “Limited Edition Kimono Series”, “Unique Amber”, “Rosa Pearl”, “Bee on Hive” (retired). 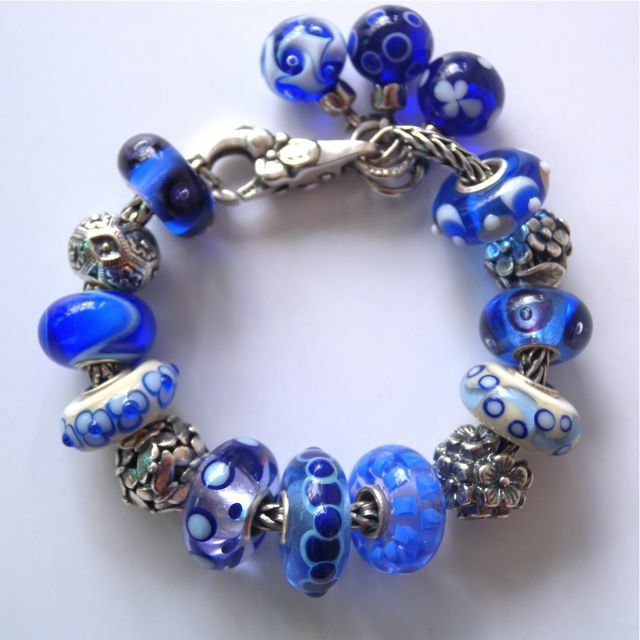 companions on this bracelet help to draw out and enhance the shimmering blue that swirls in its depths. 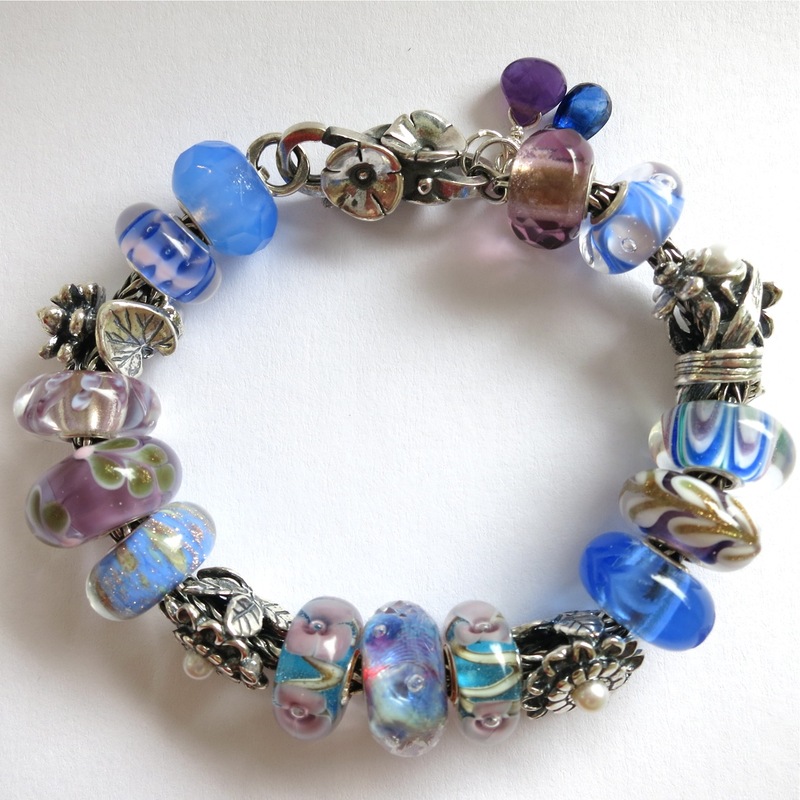 I was delighted to find this unique that nicely echoed the overall palette and colour mood of the bracelet… the rippling patterns in lilac, mint green and rich blue remind me of fabulous, Venetian end papers from antique, leather bound and gilded books…. It’s so impossibly elegant and perfectly Italian, I love it. 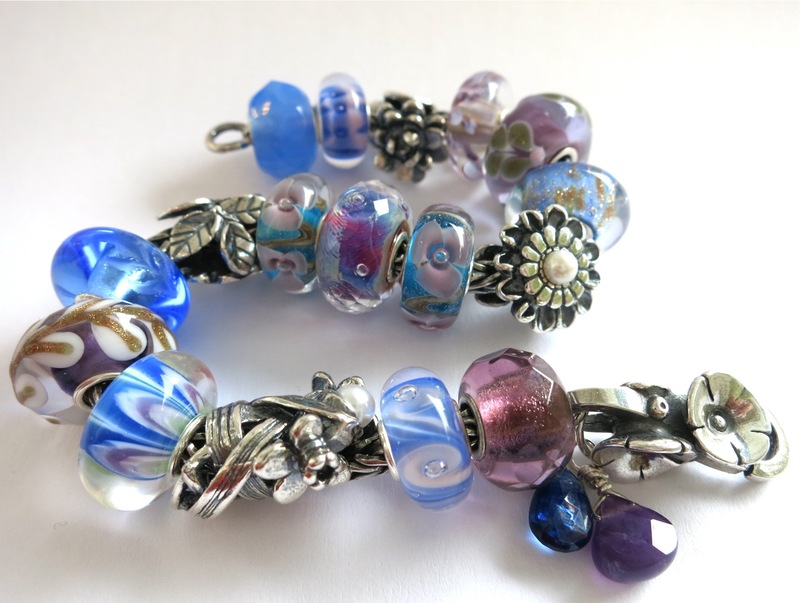 Clockwise from clasp: “Stories of You Clasp”, “Purple Prism”, “Unique”, “Daffodil of March”, “Unique”, “Unique”, “Engraved Poetic”, “Chrysanthemum of November”, Unique”, “Faceted Aurora”, “Unique”, “Chrysanthemum of November”, “Fountain of Life”, “Unique”, “White Petals”, “Waterlily”, “Unique”, “Denim Prism”. There’s an charming, old fashioned expression for the time when an expectant Mother first feels her baby move. It’s usually a very subtle sensation, the gentlest tickling or bubbly feeling. However, when one feels it there’s no question that one’s pulse races, so perhaps it makes sense that it’s traditionally called “The Quickening”. This weekend Spring gently crept across Vancouver, and it felt like a quickening of the season. After such a long hard winter we finally felt like the land came back to life. The breeze was warm enough that the children were playing in the garden with bare arms. There are now so many blossoms peeking out, and all the evergreens visibly preen in the sunshine. 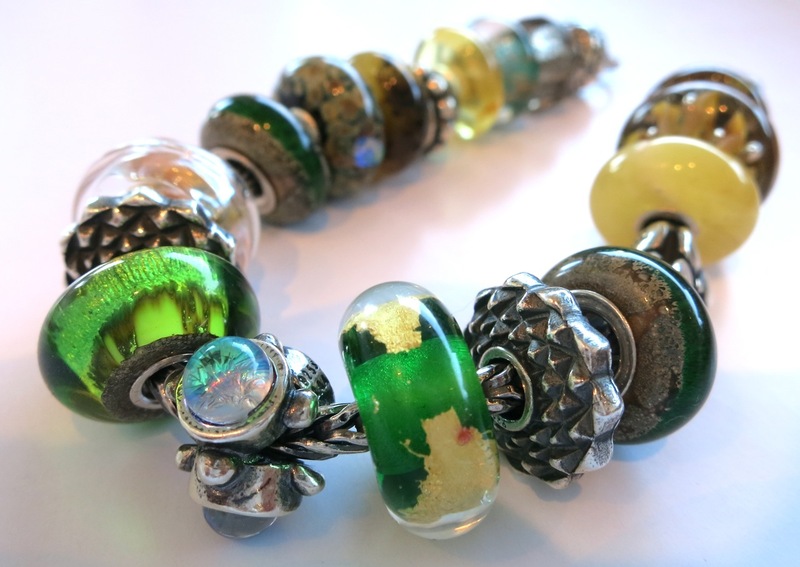 olive toned “Black Flower Mosaic”, “Trinity”, with a glittering dichroic glass dots… a sparkling “Oasis” from the new Spring 2014 collection, and a pair of Kathy Perras artisan “Old Earth”. 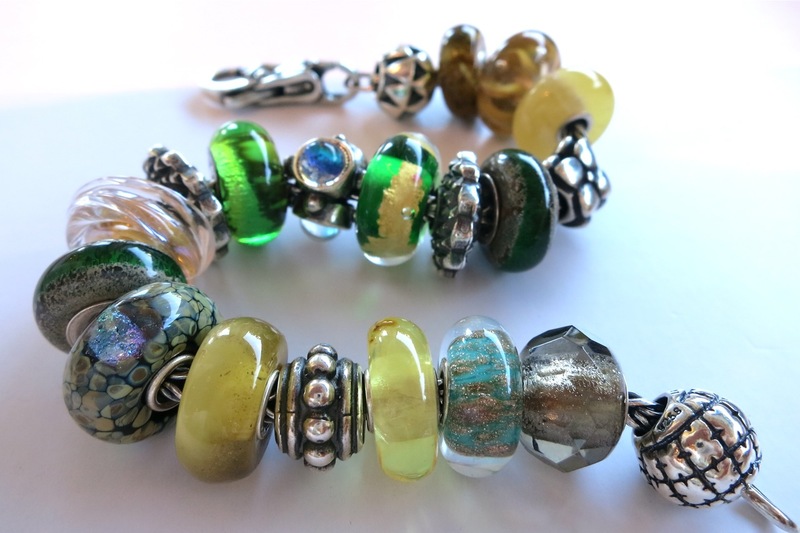 Sunshine streams into this bracelet design with some nicely interspersed unique ambers and a few well chosen glass. 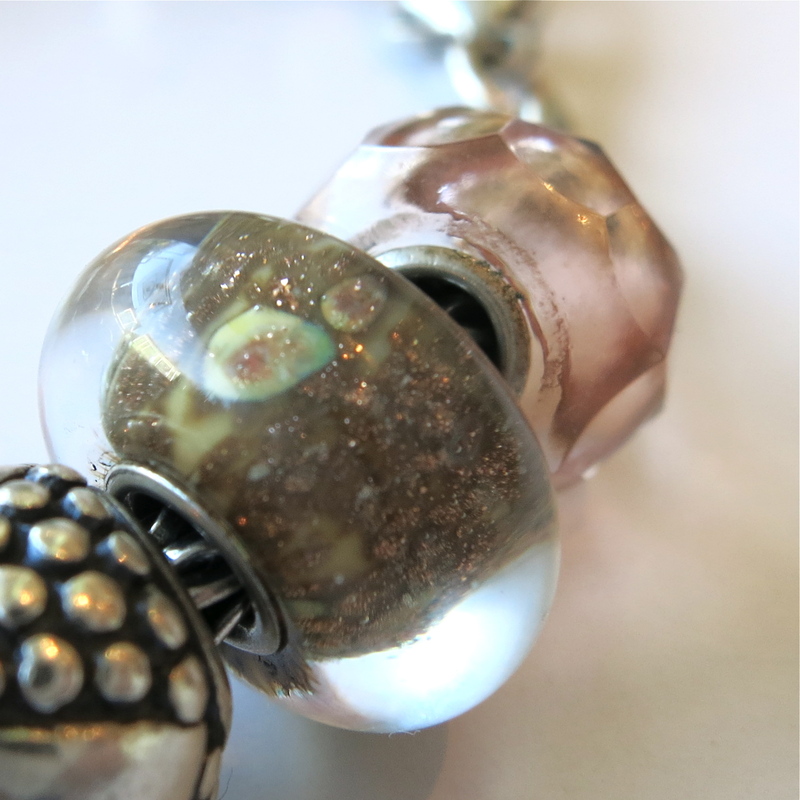 “Dewdrops”, for example, has a sunray look about it, and the light reflects beautifully off its silver core, making it appear to be illuminated from within. 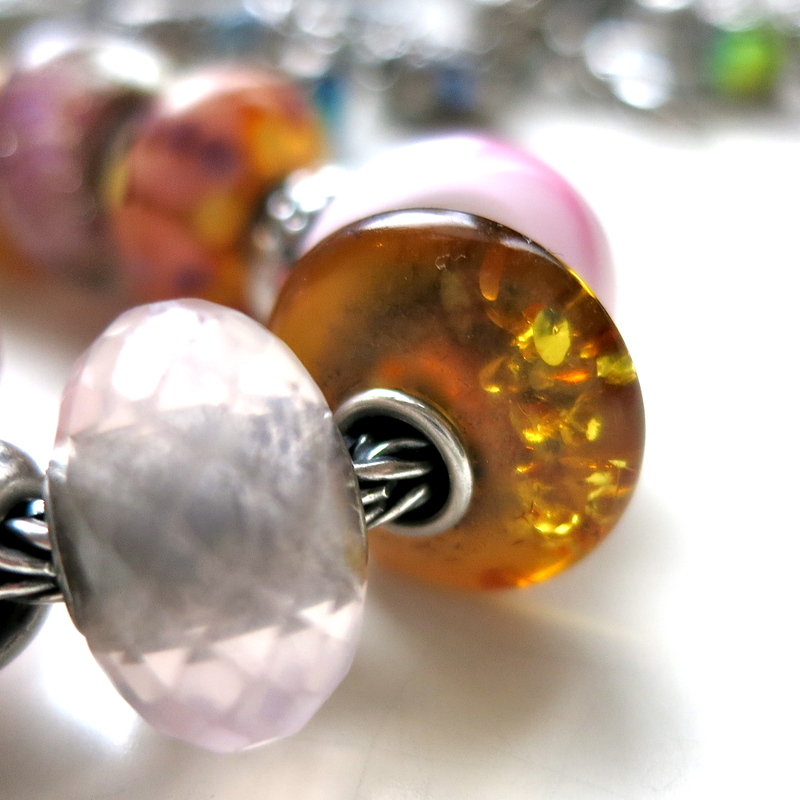 The same is true of “Honey Dawn” which glows with an iridescent light. 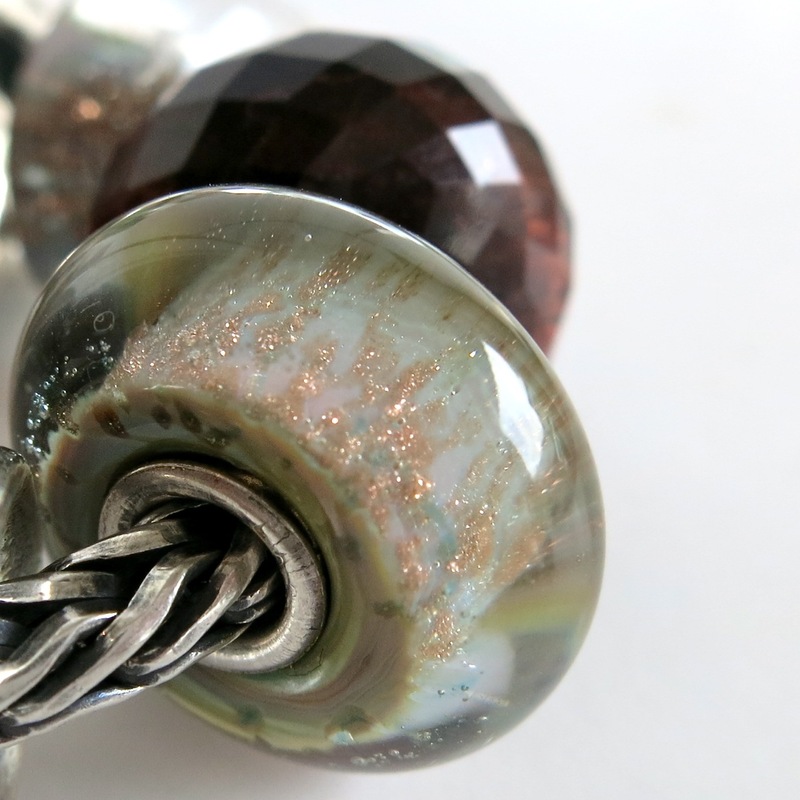 Clockwise from clasp: “Freya Lock”, “Nomad”, “Grey Prism”, “Oasis”, “Unique Amber”, “Harmony”, “Unique Amber”, “Black Flower Mosaic”, “Artisan”, “Honey Dawn”, “Kaleidoscope”, “Earth”, “Trinity”, “Heart Chakra”, “Kaleidoscope”, “Artisan”, “Flowers” (retired), “Unique Amber”, “Dewdrops”, “Unique Amber”, “Moroccan Cushion”. 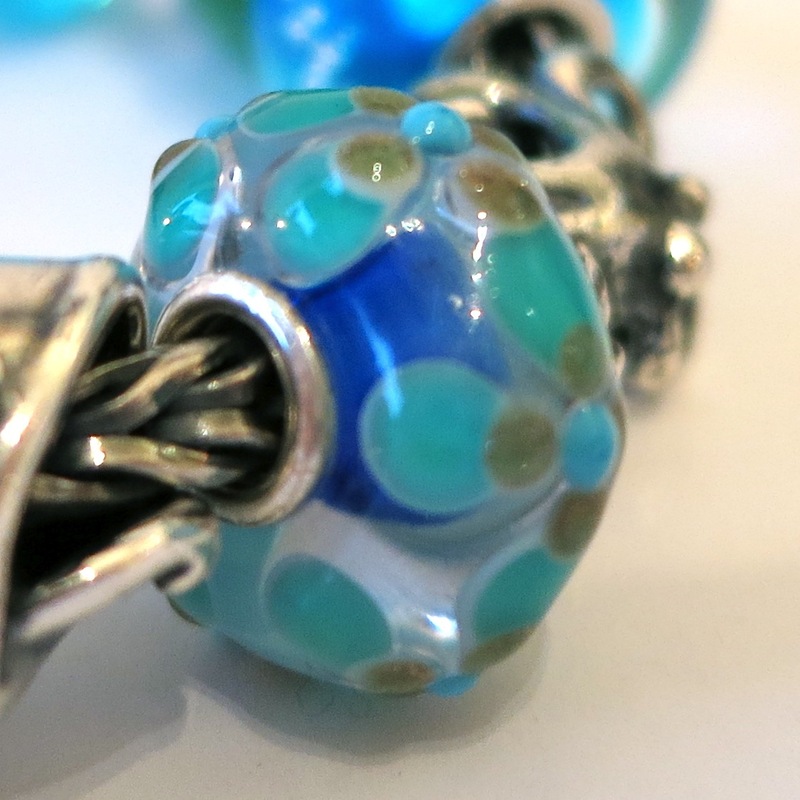 One of my new favorite beads is “Fountain of Life”, from the recently released Spring collection. 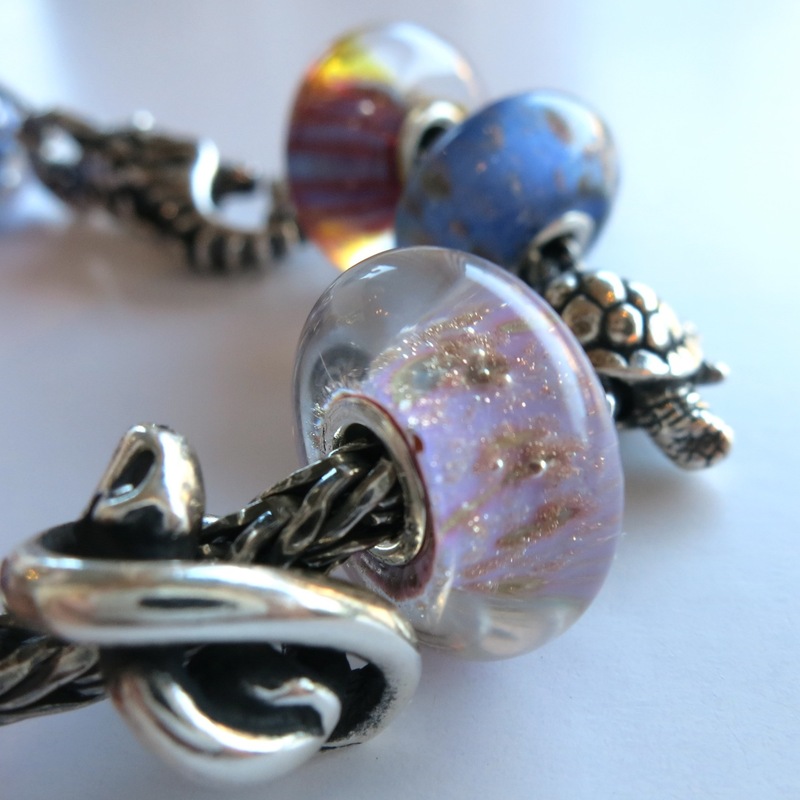 This sparkling little beauty will find its way onto a wide range of compositions in the coming weeks, as I can see it playing nicely with our beloved Azure bubbles, silver mountain, Labradorite, and so many others. It is difficult to capture its gorgeous shade of blue accurately, but I’ve tried here with soft, North facing natural light. 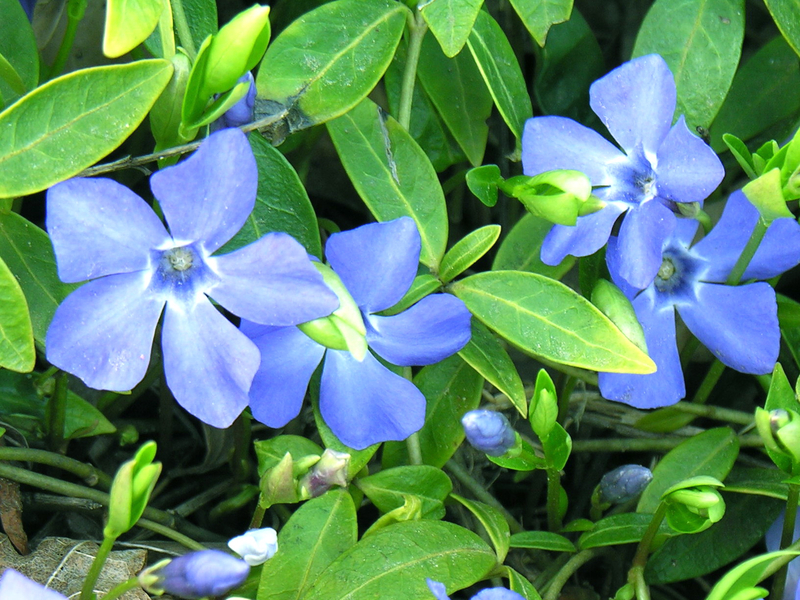 It is a delicate shade of periwinkle. 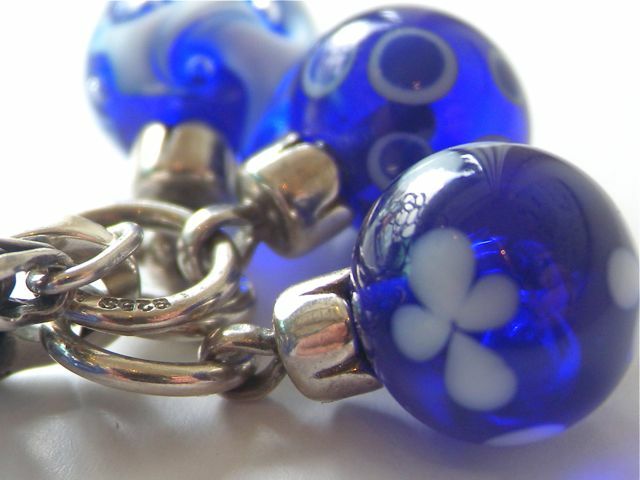 This blue is named for the charming flower that bears the same color blossoms each Spring in our garden. without damaging them. It’s happy in their shade and is easy to neatly trim back at the edge of a lawn for a well manicured look. It blooms effortlessly, – sometimes twice a year – doesn’t need deadheading and I’ve never seen one struggling with aphids, black spot, leaf mold or other similar garden issues. If only everything was so easy! Periwinkle’s shade of blue hints towards lilac, rather than aqua… and consequently it plays very nicely with all sorts of pinks. 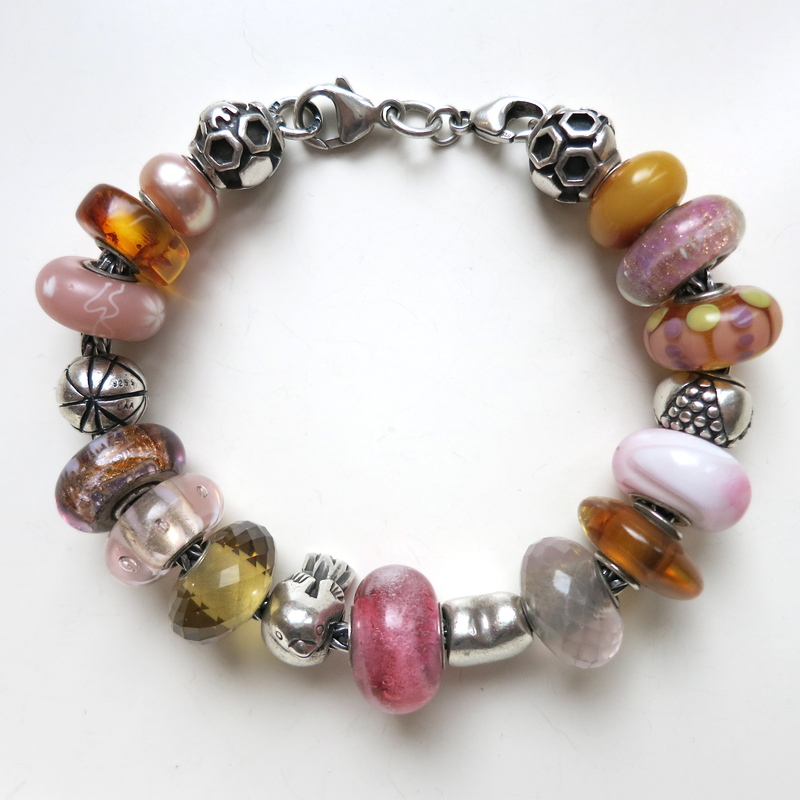 In this bracelet design Cristi added some fresh pinks: a “Desert Rose”, “Pink Prism”, “Unique Ladybug” and one of the limited edition duo tone Armadillos that just arrived at Tartooful. I particularly like the slightly complementary note of the warm pinks opposite the cool blue, it’s a wonderful combination that has always made my heart sing. 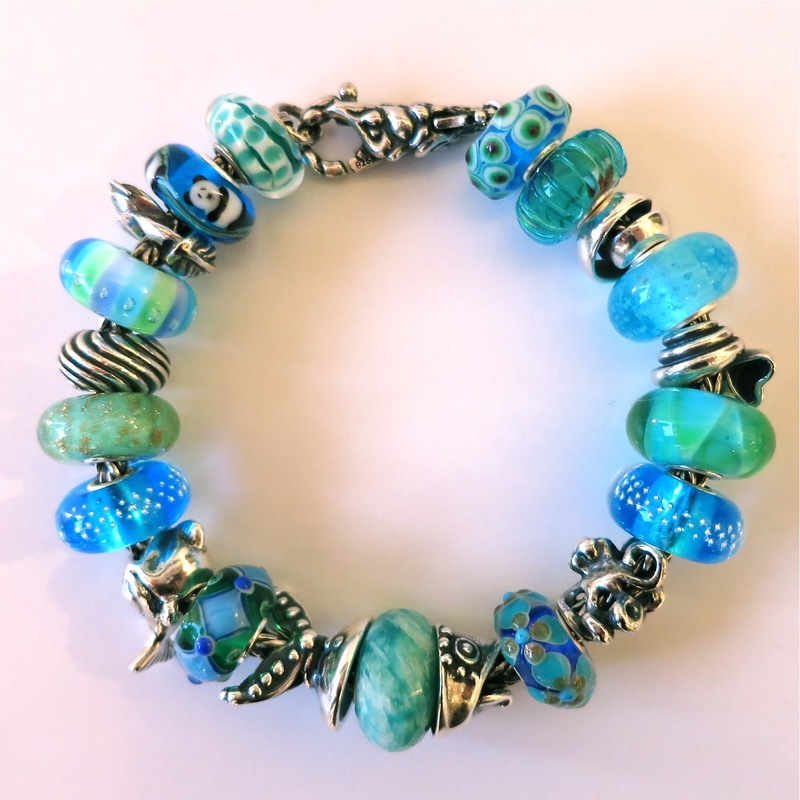 Note how well these “Fountain of Life” enhance the blue undertones of the “Aurora” series of beads… that would make an entire bracelet design all on its own! 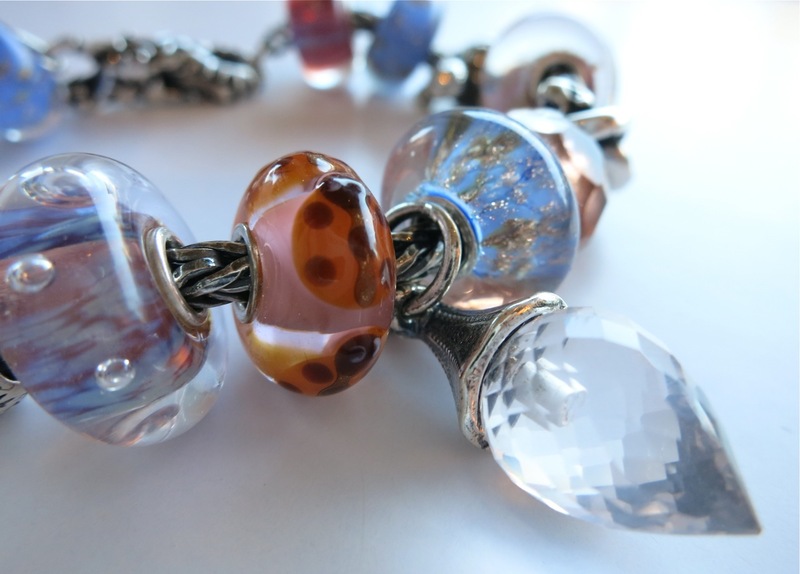 clockwise from clasp: “Sun Moon Stars Clasp”, “Aurora Stripe”, Fountain of Life”, “African Tortoise”, “Desert Rose”, “Snake”, “Pink Prism”, “Fountain of Life”, “Drops of Delight”, “Unique”, “Moonlight Bubbles”, “Nomad”, “Unique”, “Limited Edition Pink and Orange Armadillo”, “Jewel Fairy Basselet”, “Fountain of Life”. 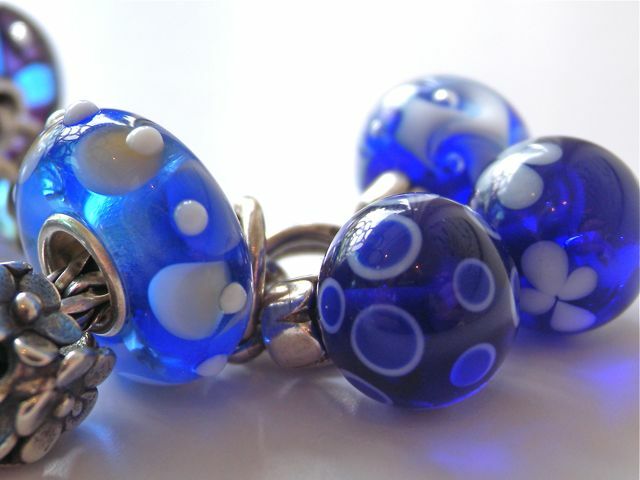 A recent online inquiry prompted me to play with some of the cobalt blue beads that we currently have in stock and the result is a great reminder of houw powerful and beautiful this colour can be. 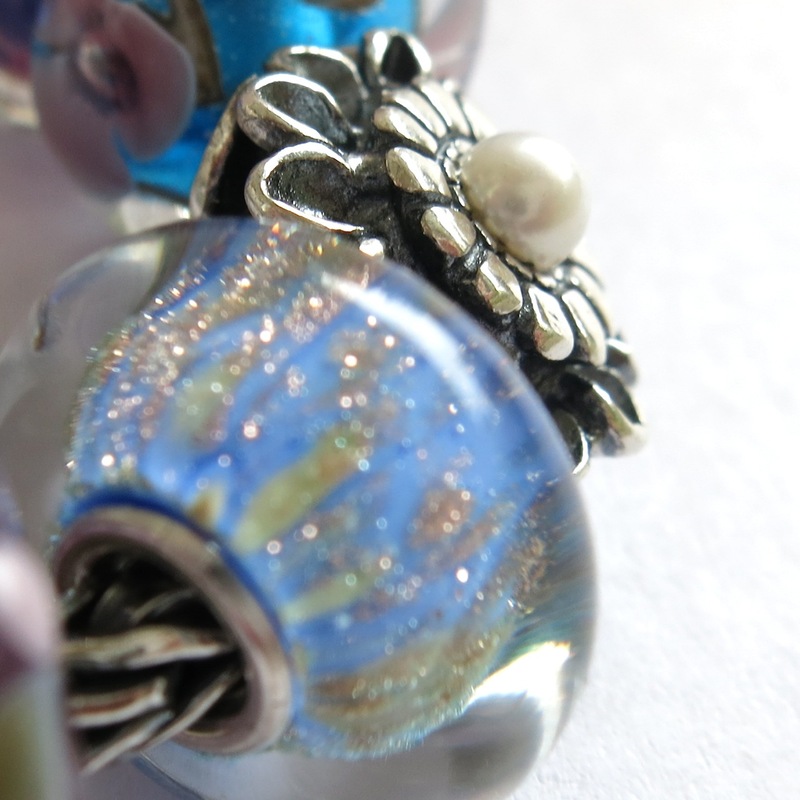 It all began with this ivory bead with delicate blue flowers scrolling around it…. I had placed it in the past in softer blue compositions, using the ivory background to soften the brilliant cobalt. When the question came this morning of whether it would stand up to a bolder, cobalt composition I wasn’t initially sure of my answer. 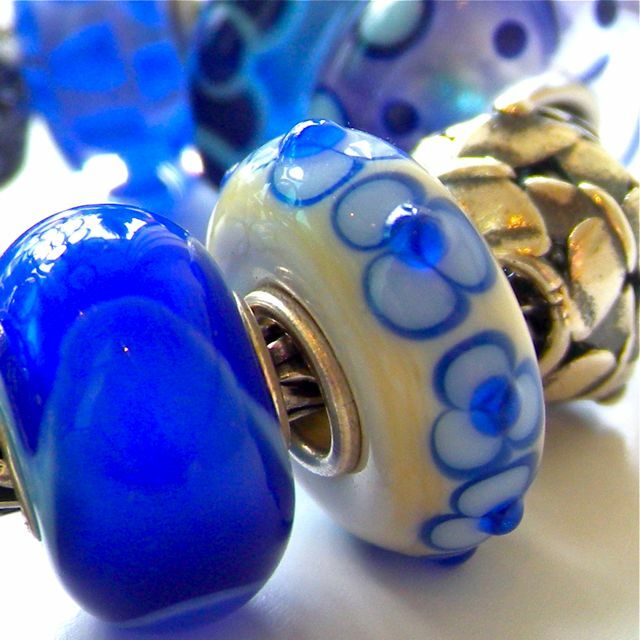 However, as may be seen in these photos, this little lovely fits right in with its cobalt companions. 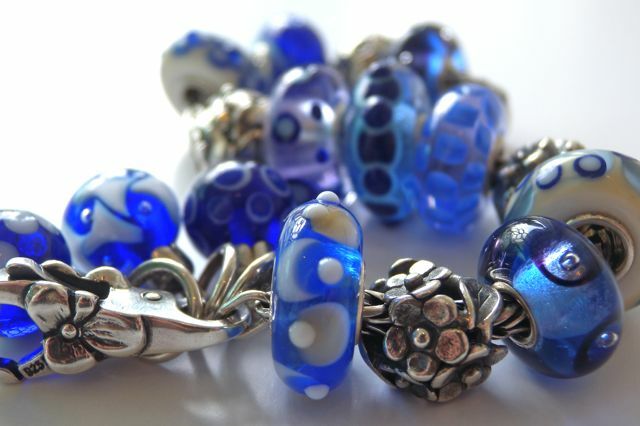 We have a number of excellent blue uniques in stock at the moment, so it was fun and easy to pop together a fresh composition. 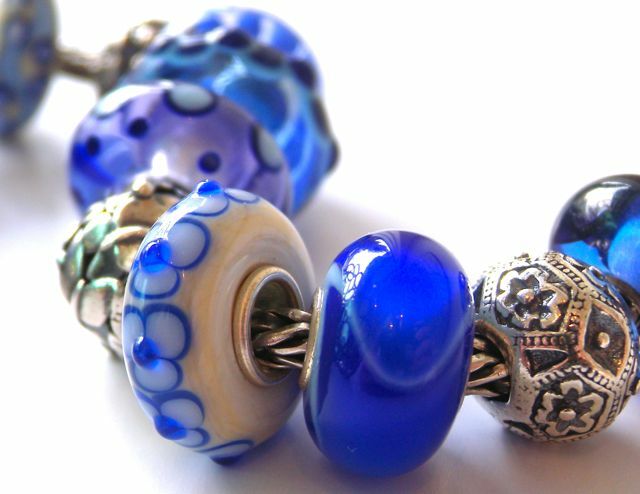 The blue, silver and glass tassels that grace the clasp of this bracelet are our last few Christmas Ornaments, but in this composition they don’t feel the least bit seasonal… they’re just a fun design element – simple, pretty and glowing in the light . It’s a extravagant gesture to place not one or two but three (!) 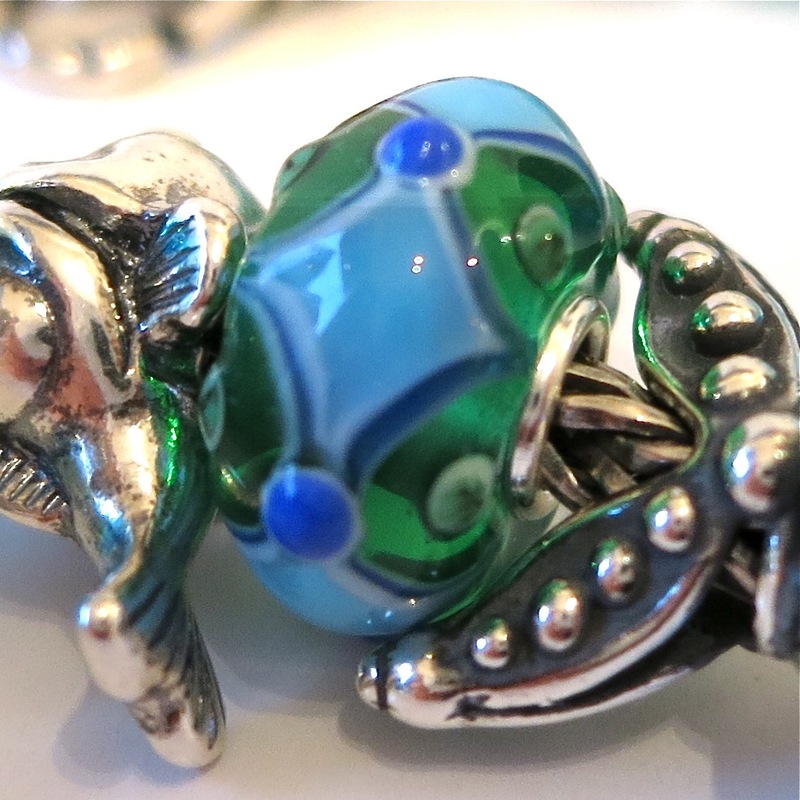 on the clasp. 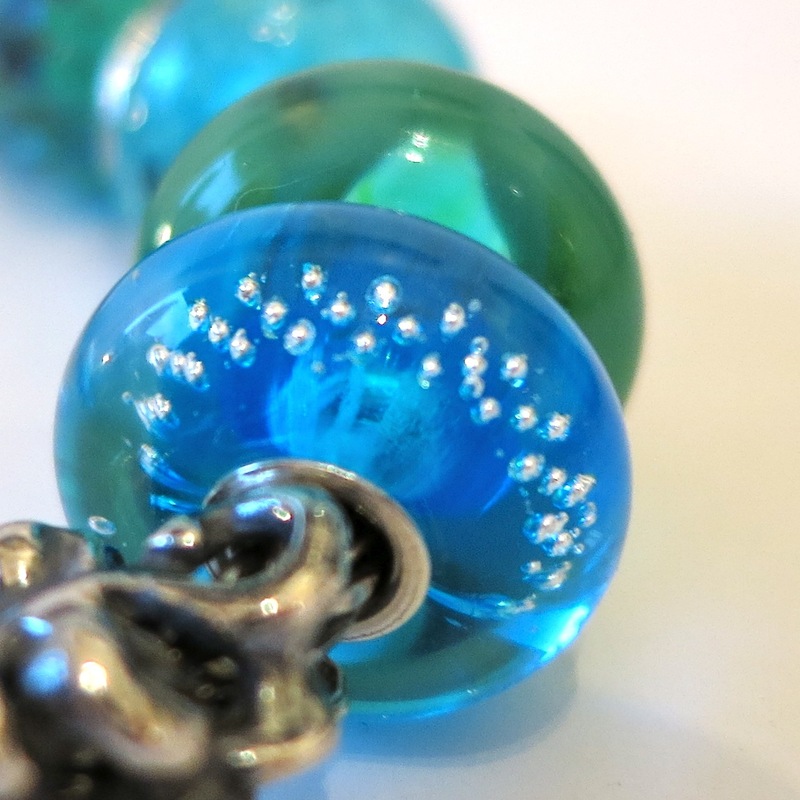 These droplets would be lovely clustered at the end of a Fantasy Necklace as well. 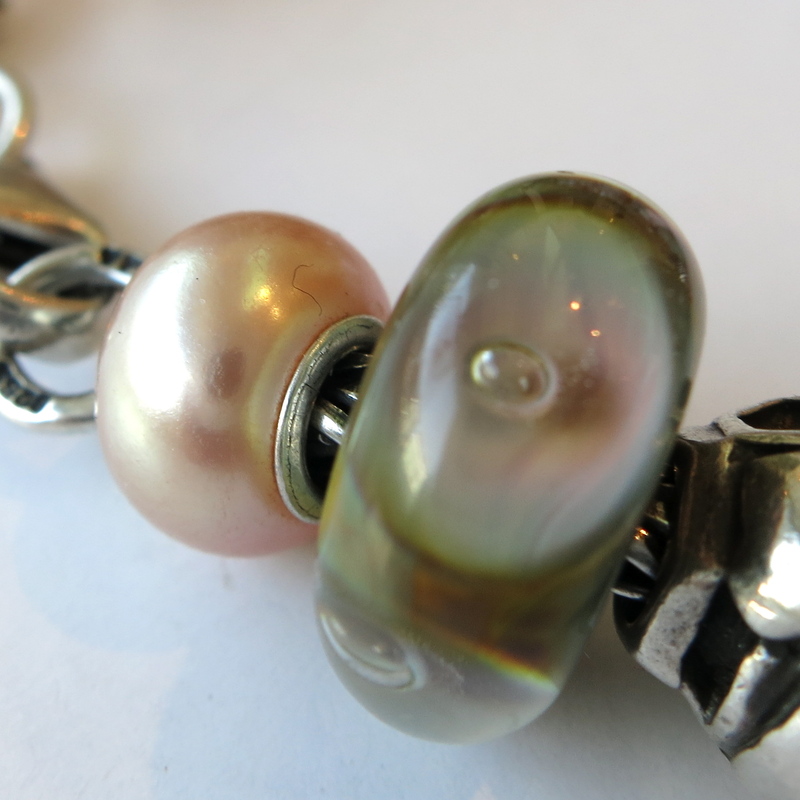 The pearl drop would nestle in among the glass tassels, becoming one of the group. The overall effect is rich and musical. Thank you for your questions and design challenges… they inspire us and keep our imaginations working!